2005-03-30 Application filed by 구글 잉크. filed Critical 구글 잉크. 이용자의 이메일(또는 이메일 콘텐트를 포함하는 문서)이 즉각적으로 렌더링되고 이용 가능하고 이용될 때 적당한 광고들이 추후 업데이트되는 비동기 및 기회주의적 이용 가능한 방법이 기술된다. When the user's e-mail (or a document that contains the e-mail content) is immediately rendered as being available to be used in a suitable advertising techniques are asynchronous and opportunistically use available methods to be updated later. 이 방법은 광고 이용 이메일 콘텐트를 렌더링하는데 악영향을 끼치지 않는 것을 보장한다. This is to ensure that it does not adversely affect to render the ad using the email content. 예를 들어, 웹 기반 이메일 서버는 (a) 이메일을 포함하는 문서에 대한 요구를 수용하고, (b) 요구 식별자를 생성하고, (c) 요구 식별자와 연관된 요구된 문서를 서빙하고, 및 (d) 이메일의 콘텐트와 연관된 적어도 하나의 광고를 얻음으로써 이메일을 이용하여 광고들을 서빙을 용이하게 할 수 있다. For example, the Web-based e-mail server (a) receiving a request for a document including e-mail, and generates the (b) request the identifier and, (c) and serving the requested document associated with the request identifier, and (d ) may use your email by obtaining at least one ad associated with the content of the e-mail to facilitate the serving of advertisements. 웹 기반 이메일 서버는 추가로 (e) 저장을 할 수 있다. Web-based e-mail server can be added to (e) Save as. 얻어진 광고(들)은 (f) 광고 요구를 수용하고, (g) 광고 요구로부터 정보를 이용하여 저장된 광고(들)을 판독하고, (h) 광고(들)을 서빙한다. Ad (s) obtained is (f) receives the advertisement request reads out the, (g) ad (s) stored by using information from the ad request, and serving to (h) advertisement (s). 본 발명은 광고에 관한 것이다. The present invention relates to advertising. 특히, 본 발명은 광고자가 광고들을 타켓화할 수 있는 가능성들을 확장하는 것에 관한 것이다. In particular, the invention relates to extending the possibilities that can be the advertiser to target ads. 상호작용 광고는 광고자들이 광고들을 각각의 독자에게 타켓화하기 위한 가능성들을 제공한다. Interaction ad provides the possibility to screen advertisers to target ads to individual readers. 특히, 타켓화된 광고들은 광고들이 몇몇 이용자 활동(예를 들어, 검색 엔진에 대한 이용자의 검색 질문, 이용자에 의해 요구됨 문서의 콘텐트, 기타 등등)으로부터 추론될 요구에 연관될 수 있기 때문에, 유용하다. In particular, the target screen advertisements because the ads are to be associated with a requirement to be inferred from some user activity (for example, searches the user's questions about search engines, content, etc. of the documents required by the user), it is useful . 질문 검색어 연관 광고는 캘리포니아주 마운틴 뷰시의 구글에 의한 AdWords 광고 시스템 같은 검색 엔진들에 의해 이용되었다. Keywords questions related to advertising has been used by the AdWords advertising system by Google as the search engine of the Mountain byusi California. 유사하게, 콘텐트 연관 광고 시스템들은 제안되었다. Similarly, content-relevant advertising systems have been proposed. 예를 들어, 발명자로서 Jeffrey A. Dean, Georges R. Harik 및 Paul Buchheit가 있고 2002년 12월 6일 출원되고 발명의 명칭이 "METHODS AND APPARATUS FOR SERVING RELEVANT ADVERTISEMENTS"인 미국특허출원일련번호 10/314,427("본원에 참조되고 '427 출원"이라 함) 및 발명자로서 Darrel Anderson, Paul buchheit, Alex Carobus, Claire Cui, Jeffrey A. Dean, Georges R. Harik, Deepak Jindal 및 Narayanan Shivakumar이 있고 2003년 2월 26일 출원되고 발명의 명칭이 "SERVING ADVERTISEMENTS BASED ON CONTENT"인 10/375,900(본원에 참조로써 통합되고 '900 출원이라 함)은 예를 들어 웹 페이지 같은 문서의 콘텐트와 연관하여 광고들을 서빙하기 위한 방법들 및 장치를 기술한다. For example, an inventor Jeffrey A. Dean, Georges R. Harik and Paul Buchheit that there is filed December 6, 2002 and entitled & Inn "METHODS AND APPARATUS FOR SERVING RELEVANT ADVERTISEMENTS" U.S. Patent Application Serial Number 10/314 427 ( "incorporated herein by reference, and '427 application" means), and inventors are as Darrel Anderson, Paul buchheit, Alex Carobus, Claire Cui, Jeffrey A. Dean, Georges R. Harik, Deepak Jindal and Narayanan Shivakumar, and February 26, 2003 filed, and the name of the invention, the "sERVING ADVERTISEMENTS BASED oN cONTENT" 10 / 375,900 ways to serve them (which is incorporated by reference herein, the term 900 application), for example, ads associated with the web page content of such documents It describes and apparatus. 뉴욕주 뉴욕시의 "About"에 의해 제공된 스프링크(Sprink) 서비스는 광고자들이 클라이언트 측 이미지 맵들 및 쿠키들을 이용하여 동적으로 생성되는 이미지들을 이용하여 이메일의 미리 결정된 리스트로부터의 토픽들에 타켓화된 광고들을 삽입하게 한다. New York Soup links (Sprink) shares offered by the "About" New York City's services are angry advertisers to target the topic from a list of pre-determined e-mail using an image that is dynamically generated using a client-side image maps and cookies to insert the ads. 발명자가 Alexander Paul Carobus, Alex Roetter 및 Ben Davenprot이고 2003년 10월 31일 출원되고 발명의 명칭이 "SERVING CONTENT TARGETED ADS IN E-MAIL, SUCH AS E-MAIL NEWSLETTERS"인 미국특허출원일련번호 10/699,607(본원에 참조로써 통합되고 '607 출원이라 함)은 이메일 뉴스레터들 같은 이메일 문서들의 정보와 연관하여 광고들을 서빙하기 위한 방법들 및 장치를 기술한다. Inventor Alexander Paul Carobus, Alex Roetter and Ben Davenprot and is filed October 31, 2003 and the title of the invention of US Patent Application "SERVING CONTENT TARGETED ADS IN E-MAIL, SUCH AS E-MAIL NEWSLETTERS" Serial No. 10 / 699,607 (which it is incorporated by reference herein, the term 607 application) describes a method and apparatus for serving ads in conjunction with information from documents such as email with email newsletters. 발명자가 Jeffrey A.Dean, Georges R. Harik 및 Paul buchheit이고 2003년 6월 2일 출원되고 발명의 명칭이 "SERVING ADVERTISEMENTS USING INFORMATION ASSOCIATED WITH E-MAIL"인 미국특허출원일련번호 10/452,830(본원에 참조로써 통합되고 '830 출원이라 함)은 이메일 문서의 정보와 연관하여 광고들을 서빙하기 위한 방법들 및 장치들을 기술한다. The inventor Jeffrey A.Dean, Georges R. Harik and Paul buchheit and June 2003 is 2 application and the title of the invention "SERVING ADVERTISEMENTS USING INFORMATION ASSOCIATED WITH E-MAIL" U.S. Patent Application Serial Number 10/452 830 (herein are incorporated by reference '830 application referred to) describes a method and apparatus for serving ads in conjunction with the information in the e-mail document. '830 출원은 전송자 클라이언트 장치, 수신자 클라이언트 장치, 웹 기반 이메일 서버 등등의 애플리케이션을 이용하는 것을 포함하는 이메일에 다른 방식으로 광고들을 서빙하는 것을 기술한다. '830 application describes a different way to serve ads in an email that includes using the sender client device, the recipient client, a Web-based e-mail server, and so on the application. 임의의 경우, 광고들은 이메일의 콘텐트(또는 다른 정보)로부터 추출될 수 있는 연관 정보(예를 들어, 개념들, 토픽들 등등)로 타켓화된다. In any case, the ads are targeted to the screen can be extracted associated information (e. G., Concepts, topics, and so on) that from the content of e-mail (or other information). 핫메일 및 야후는 이메일 콘텐트 자체의 부분이거나, 이용자의 웹 브라우저 스크린상 이메일의 디스플레이에 인접한 광고들을 디스플레이하는 웹 기반 이메일 서비스들을 가진다. Hotmail and Yahoo e-mail content or part of itself, has a Web-based e-mail service that displays the user's ads adjacent to the display screen of the Web browser on the email. 바람직하지 않게, 이들 서비스들은 다수의 바람직하지 않은 특성들을 가진다. Undesirably, these services have a number of undesirable characteristics. 예를 들어, 이메일 바디에 광고들을 삽입하는 것은 특히 만약 광고들이 이용자에게 유용하지 않다면 이용자에게 성가신 일이다. For example, to insert advertisements in the email body is one annoying to the user, especially if the ads if they are not useful to the user. 이런 광고들은 광고를 포함하도록 변경되지 않은 이메일을 전송하기 어렵게 하거나 불가능하게 하기 때문에, 실제 이메일 콘텐트에서 주의를 돌리게 할뿐 아니라, 전체적으로 이메일 서비스의 값을 낮춘다. These ads because they make it difficult or impossible to send the e-mail unchanged to include ads, as well as to divert attention from the actual e-mail content, lowers the overall value of the email service. 이용자는 이메일을 판독하는 동안 현재 생각하는 바와 연관되지 않은 광고 주제에 덜 민감하게 된다. Users are less sensitive to unrelated topics discussed current thinking ads while reading an e-mail. 바람직하지 않게, 핫메일 및 야후 이메일 광고들은 이메일 콘텐트로 타켓화되지 못한다. Undesirably, Hotmail and Yahoo email ads are not being targeted by angry e-mail content. 게다가, 웹메일 디스플레이에 인접한 배너 광고들의 디스플레이는 절대적인 명제이고; In addition, the display of a banner ad is displayed adjacent to the webmail and absolute proposition; 광고 서버가 작동하고 광고들이 보여지거나, 작동하지 않고 광고들이 보여지지 않는다. The ad server or ad to show works and does not work without the ads are shown. 게다가, 만약 광고 서버가 오버로드되고 응답하는데 느리면, 모든 이메일 콘텐트의 디스플레이를 느리게 하는 병목 현상이 나타난다. Besides, if the ad server is overloaded and slow to respond, the bottleneck appears to slow down the display of all email content. 상기 측면에서, 이메일이 렌더링된 광고들을 개선하는 것이 바람직하다. That in terms of the improvement of the e-mail it is preferred to render the ad. 예를 들어, 이메일에 광고들을 서빙하기 위하여 이용된 시스템과 무관하게, 이용자들이 연관없는 광고들을 무시하기 때문와 연관하여 광고들을 가지는 것이 바람직할 수 있다. For example, it may be desirable in connection irrespective of the system used to serve ads on e-mail, ttaemunwa to ignore the advertising without the user are associated with the advertisement. 따라서, 예를 들어, 꽃꽂이를 논의하는 이메일은 꽃꽂이와 연관하여 광고들을 트리거하여야 한다. Thus, for example, e-mail to discuss the arrangement shall be in connection with the arrangement triggered the ad. 게다가, 이메일 콘텐트가 일반적으로 매우 개인적이기 때문에, 이용자는 만약 그들이 공적으로 이용 가능한 웹 콘텐트를 간단히 브라우징하는 것보다 중단없이 빠르게 읽기를 원한다. In addition, because the e-mail content is usually very personal, the user wants to read quickly without disruption than if they simply browsing the Web content available to the public. 광고들이 훼방을 놓지 않도록 이메일 콘텐트의 렌더링이 광고들의 서빙 및 렌더링에 무관한 것이 바람직하다. It was not to place ads that hinder rendering of e-mail content is unrelated to serving and rendering of advertising is preferable. 또한, 통신 및/또는 계산 대역폭을 최소화하거나, 적어도 감소시키거나 관리할 수 있는 것이 바람직하다. In addition, the communication and / or minimize the bandwidth calculation, or it is desirable to be able to reduce or at least control. 본 발명에서 일관된 실시예들은 이용자의 이메일이 렌더링되고, 만약 이용되면 적당한 광고들이 추후에 업데이트되는 비동기 및 기회주의적 이용 방법을 제공함으로써 광고들의 이용 가능성이 이메일 콘텐트의 렌더링에 악영향을 끼치지 않는 것을 보장하기 위하여 이용될 수 있다. Consistent embodiment the present invention ensures that the user's email is rendered, if that does not when used by providing asynchronous and opportunistically using methods suitable ads that are updated in the future the availability of advertising adversely affect the email content rendering It can be used to. 본 발명에서 일관된 예시적인 실시예들은 (a) 이메일 콘텐트를 포함하는 문서에 대한 요구를 수용하고, (B) 요구 식별자를 생성하고, (c) 요구 식별자와 연관하여 요구된 문서를 서빙하고, (d) 이메일의 콘텐트와 연관하여 적어도 하나의 광고를 얻음으로써 이메일에 광고를 손쉽게 서빙할 수 있다. Consistent with an illustrative embodiment in the present invention are (a) receiving a request for a document including e-mail content, generates (B) the request identifier, and served to the documentation requirements in association with (c) the request identifier, and ( d) it can be easy to serve ads in email by obtaining at least one ad associated with the content of the email. 상기 예시적인 실시예들은 예를 들어 웹 기반 이메일 서버에 포함될 수 있다. The exemplary embodiments are, for example, be included in a Web-based e-mail server. 상기 예시적인 실시예들은 추가로 (e) 얻어진 광고(들)을 저장하고, (f) 광고 요구를 수용하고, (g) 광고 요구로부터의 정보를 이용하여 저장된 광고(들)을 판독하고, (h) 광고(들)을 서빙할 수 있다. The exemplary embodiments and the read additional to (e) obtained stores the ad (s) and, (f) accept an ad request, and, (g) ad (s) stored by using information from the ad request, ( h) may serve the advertisement (s). 본 발명에서 일관된 적어도 몇몇 실시예들에서, 광고 요구는 요구된 문서가 렌더링될 때, 또는 요구된 문서가 렌더링된 후 클라이언트 장치에 의해 공급될 수 있다. In at least some embodiments consistent with the present invention, the ad request may be supplied by the time the requested document to be rendered, or rendered the requested document and then the client device. 클라이언트 장치는 예를 들어 브라우저일 수 있다. The client device can be, for example, a browser. 본 발명에서 일관된 적어도 몇몇 실시예들에서, 광고 요구는 요구 식별자를 포함할 수 있다. In at least some embodiments consistent with the present invention, the ad request may include the request identifier. 요구 식별자는 요구 식별자와 연관하여 저장된 광고(들)을 조사하기 위하여 이용될 수 있다. Request identifier can be used to examine the ad (s) stored in association with the request identifier. 본 발명에서 일관된 적어도 몇몇 실시예들에서, 요구 식별자와 연관하여 요구된 문서를 서빙하는 동작은 제 1 스레드(thread)에 의해 수행되고 이메일의 콘텐트와 연관하여 적어도 하나의 광고를 얻는 동작은 제 2 스레드에 의해 수행될 수 있다. In consistent at least some embodiments the present invention, the act of serving the document request in association with the request identifier is performed by a first thread (thread) operation for obtaining at least one ad in association with the content of the email is the second It may be performed by a thread. 제 1 스레드의 실행은 제 2 스레드의 실행과 무관할 수 있다. Execution of the first thread may be independent of the execution of the second thread. 본 발명에서 일관된 예시적인 실시예들은 (a) 이메일 콘텐트를 포함하는 문서를 요구하고, (b) 문서를 수용하고, (c) 문서를 렌더링하고, (d) 문서의 이메일 콘텐트와 연관하여 적어도 하나의 광고를 요구하고, (e) 광고(들)을 수신하고, (f) 렌더링된 문서에 연관하여 광고(들)을 렌더링함으로써 이메일에 광고들의 서빙을 용이하게 할 수 있고, 여기서 광고(들)은 문서의 이메일 콘텐트가 이미 렌더링된 후 렌더링된다. Consistent with an illustrative embodiment in the present invention are (a) requires a document including e-mail content, and, (b) receiving the article, and, (c) rendering the document, wherein at least one, in association with (d) a document e-mail content of the requires the ad, and to receive the (e) advertisement (s) and, (f) it is possible to facilitate the serving of advertisements to e-mail by in association with the rendered document rendering the ad (s), where the ad (s) is rendered after the e-mail content of the document has already been rendered. 상기 예시적인 실시예들은 예를 들어 웹 브라이저에 포함될 수 있다. The exemplary embodiments are, for example, be included in a web browser. 본 발명에서 일관된 적어도 하나의 실시예들에서, 수용된 문서는 요구 식별자를 포함하고 문서의 이메일 콘텐트와 연관하여 적어도 하나의 광고를 요구하는 동작은 요구 식별자를 포함하는 요구를 생성하는 것을 포함한다. In at least one embodiment consistent with the present invention in, received document operation request containing the identifier and requesting at least one ad in association with the e-mail content of the document will include generating a request including the request identifier. 본 발명에서 일관된 적어도 하나의 실시예에서, 문서의 이메일 콘텐트와 연관하여 광고(들)을 요구하는 동작은 적어도 하나의 광고에 대한 요구를 나타내는 URL을 구성하는 것을 포함한다. In the present invention, at least one embodiment consistent in, and in connection with e-mail content of the document operation request to the ad (s) may comprise configuring a URL representing a request for the at least one advertisement. 문서의 이메일 콘텐트와 연관하여 광고(들)을 요구하는 동작은 URL을 취하고 문서에서 제공된 웹 기반 이메일 서버로부터의 광고(들)을 요구하는 액티브엑스(ActiveX) 오브젝트(또는 브라우저의 구성요소로서 실행되는 몇몇 다른 다운로드 가능한 코드)를 인스턴시에이팅하는 것을 더 포함할 수 있다. In conjunction with article Email the contents of the operation that requires the ad (s) will be run as ActiveX (ActiveX) components of the object (or the browser that requires the ad (s) from web-based email server takes the URL provided in the document some other downloadable code) may further comprise Ting instance Associates. 본 발명에 일관된 적어도 하나의 실시예에서, 만약 문서가 웹 페이지이면, 문서의 렌더링된 이메일 콘텐트와 연관하여 적어도 하나의 광고를 렌더링하는 동작은 광고들을 렌더링하기 위하여 웹 페이지의 문서 오브젝트 모델을 조작하는 것을 포함한다. In the present invention, consistent at least one embodiment to, and if the document is a Web page, the act of rendering the at least one ad in association with the rendered e-mail content of the document is to manipulate the document object model of the Web page to render the ads It includes. 도 1은 본 발명이 이용되는 예시적인 온 라인 광고 환경을 도시하는 블록도. Figure 1 is a block diagram illustrating an exemplary on-line advertising environment in which the present invention is used. 도 2는 본 발명에 일관된 방식으로 광고들을 서빙하기 위하여 웹 기반 이메일 서버에 의해 이용될 수 있는 예시적인 방법의 흐름도. Figure 2 is a flow diagram of an example method that may be used by a Web-based e-mail server to serve ads in a manner consistent with the present invention. 도 3은 본 발명에 일관된 이메일에 콘텐트 연관 광고들을 렌더링하기 위하여 클라이언트 장치 브라우저에 의해 이용될 수 있는 예시적인 방법의 흐름도. Figure 3 is a flow chart of an exemplary method that may be used by the client device browser to render content-relevant ads on a consistent e-mail to the invention. 도 4는 하나 이상의 동작을 수행하고 본 발명에 일관된 방식으로 이용되고 및/또는 생성된 정보를 저장하는 기계의 블록도. 4 is a block diagram of a machine for storing one or more of the operations carried out and used in a consistent manner with the present invention and / or generating information. 도 5는 본 발명의 예시적인 실시에의 다양한 예시적인 동작들 사이의 통신을 도시하는 메시징을 도시한 도면. Figure 5 shows a messaging diagram illustrating communications among various exemplary operations of the exemplary embodiment of the present invention. 도 6은 본 발명에 일관되고, 이메일 바디 콘텐트 및 텍스트 기반 콘텐트 연관 광고들을 포함하는 예시적인 브라우저 윈도우를 도시한 도면. Figure 6 is consistent with the present invention, illustrates an exemplary browser window, including e-mail body content and text-based content relevant ads. 본 발명은 이메일에 콘텐트 연관 광고들을 서빙하기 위한 새로운 방법들, 장치, 메시지 포맷들 및/또는 데이터 구조들을 포함할 수 있다. The invention may include a novel method, apparatus, message formats and / or data structures for serving content-relevant ads to the e-mail. 다음 설명은 당업자가 본 발명을 만들고 이용할 수 있게 제공되고, 특정 애플리케이션들 및 요구들의 환경으로 제공된다. The following description is presented to enable those skilled in the art used to create the present invention, there is provided the environment of the particular applications and requirements. 따라서, 본 발명에 일관된 실시예들의 다음 설명은 도시 및 설명을 제공하고, 개시된 정확한 형태로 본 발명을 총망라하거나 제한하도록 의도되지 않는다. Therefore, the following description of embodiments consistent with the present invention is not intended to be exhaustive or to limit the invention to the precise form disclosed provides illustration and description, and. 개시된 실시예들에 대한 다양한 변경들은 당업자에게 명백하고 일반적인 원리들은 다른 실시예들 및 애플리케이션들에 적용될 수 있다. Various modifications to the disclosed embodiments are apparent to those skilled in the art, and the generic principles may be applied to other embodiments and applications. 예를 들어, 비록 일련의 동작들이 흐름도를 참조하여 기술될 수 있지만, 동작들의 순서는 하나의 동작의 수행이 다른 동작의 완료에 의존하지 않을 때 다른 실행들에서 다를 수 있다. For example, although a series of acts may be described with reference to a flow chart. However, the order of the operations may be performed in one operation may be different in different runs when not dependent on the completion of another action. 게다가, 독립적인 동작들은 병렬로 수행될 수 있다. Moreover, non-dependent acts may be performed in parallel. 상세한 설명에 이용된 엘리먼트, 동작 또는 명령이 만약 이와 같이 명확하게 기술되지 않는다면 본 발명에 중요하거나 필수적으로 구성되지 않는다. The element, act, or instruction used in the description is important for the present invention if not expressly stated in this way, or not to be construed as essential. 또한, 여기에 이용된 바와 같이, 조사 "어"는 하나 이상의 아이템들을 포함하는 것으로 의도된다. Also, as used herein, irradiation, "year" is intended to include one or more items. 단지 하나의 아이템이 의도되는 경우, 용어 "원" 또는 유사한 언어가 이용된다. If only one item is intended, the term "one" or similar language is used. 따라서, 본 발명은 도시된 실시예들로 제한되는 것으로 의도되지 않고 본 발명자들은 기술된 특허 가능한 주제로서 본 발명을 고려한다. Accordingly, the present invention is the inventor is not intended to be limited to the illustrated embodiments allows for the present invention as described patentable subject. 다음에서, 본 발명이 동작할 수 있는 실시예들은 §4.1에 기술된다. In the following, an embodiment in which the present invention may operate are described in §4.1. 그 다음, 본 발명에 일관된 예시적인 실시예들은 §4.2에 기술된다. Next, consistent with the present invention exemplary embodiments are described in §4.2. 동작들의 예들은 §4.3에 제공된다. Examples of operations are provided in §4.3. 마지막으로, 본 발명에 관한 일부 결론들은 §4.4에 기술된다. Finally, some conclusions regarding the present invention are described in §4.4. 온라인 광고들은 다양한 고유한 특징들을 가질 수 있다. Online advertising can have a variety of unique features. 상기 특징들은 애플리케이션 및/또는 광고자에 의해 지정될 수 있다. The features may be specified by an application and / or an advertiser. 이들 특징들은 "광고 특징들"이라 한다. These features are referred to as "ad features". 예를 들어, 텍스트 광고의 경우, 광고 특징들은 제목 라인, 광고 텍스트 및 삽입된 링크를 포함할 수 있다. For example, in the case of a text ad, ad features may include a link to the title line, ad text, and insert. 이미지 광고의 경우, 광고 특징들은 이미지, 실행 가능한 코드, 및 삽입된 링크를 포함할 수 있다. In the case of an image ad, ad features may include a link to the images, executable code, and insert. 온라인 광고의 타입에 따라, 광고 특징들은 텍스트, 링크, 오디오 파일, 비디오 파일, 이미지 파일, 실행 가능한 코드, 삽입된 정보 등 중 하나 이상을 포함할 수 있다. Depending on the type of online ad, ad features may include text, links, audio files, video files, image files, executable code, such as one or more of the embedded information. 온라인 광고가 서빙될 때, 하나 이상의 파라미터들은 광고가 서빙되는 방법, 시기, 및/또는 장소를 기술하기 위하여 이용될 수 있다. When an online ad is served, one or more parameters can be used to describe the way ads are served, when, and / or locations. 이들 파라미터들은 하기에서 "서빙 파라미터들"이라 한다. These parameters are referred to as "serving parameters" below. 서빙 파라미터들은 예를 들어 광고가 서빙되는 문서의 특징들(정보 포함), 검색 질문 또는 광고의 서빙과 연관된 검색 결과들, 이용자 특성(예를 들어, 지리적 위치, 이용자에 의해 이용되는 언어, 이용된 브라우저 타입, 이전 페이지 뷰들, 이전 행동, 이용자 계정, 시스템에 의해 이용된 웹 쿠키들, 등등), 요구를 시작하는 호스트 또는 가입자 사이트(예를 들어, 미국 온라인, 구글, 야후), 서빙되는 페이지상 광고의 절대 위치, 서빙되는 다른 광고들에 연관한 광고의 위치(공간적 또는 시간적), 광고의 절대 크기, 다른 광고들과 연관한 광고의 크기, 광고 컬러, 서빙된 다른 광고들의 수, 서빙된 다른 광고들의 타입들, 서빙된 날의 시간, 서빙된 주의 시간, 서빙된 해의 시간 등 중 하나 이상을 포함할 수 있다. Serving parameters may include, for example features (information included), search results, the user properties associated with the serving of a search query or line in the document where the ad is served (e.g., language to be used by the geographic location, the user, the use of browser type, previous page views, previous behavior of the user account, a Web cookies used by the system, and so on), host or subscriber site to start the request (eg, America online, Google, Yahoo), the served page absolute position of the ad, the location of the advertisement association to other ads served (spatial or temporal) of the ad absolute size, the size of the ad associated with the other line, the number of advertisement color, the serving other line, the serving other the types of advertising, time of day served, serving the attention may include the time, such as one or more of the time of serving it. 자연적으로, 본 발명이 환경에 이용될 수 있는 다른 서빙 파라미터들이 있다. Naturally, there are other serving parameters in which the invention may be used in the environment. 비록 서빙 파라미터들이 광고 특징들에 유일하지 않을 수 있지만, 상기 파라미터들은 서빙 조건들 또는 제한들로서 광고와 연관될 수 있다. Although serving parameters may not be unique to ad features, the parameters may be associated with an ad as serving conditions or restrictions. 서빙 조건들 또는 제한들로서 이용될 때, 상기 서빙 파라미터들은 간단히 "서빙 제한들"(또는 "타켓 기준")이라 불린다. When used as serving conditions or limits, the serving parameters are referred to as simply "the serving constraints" (or "target reference"). 예를 들어, 몇몇 실시예들에서, 광고자는 주일에 이용되고, 특정 위치보다 낮지 않고, 특정 위치 이용자들, 등등에만 서빙되는 것을 지정함으로써 광고를 서빙하는 것을 타켓화할 수 있다. For example, in some embodiments, the advertiser is used for a week, no lower than a certain position, may hwahal target to serve the ad by specifying that the particular user location, serving only and so on. 다른 실시예로서, 몇몇 시스템들에서, 광고자는 만약 페이지 또는 검색 질문이 특정 키워드들 또는 어구들을 포함하면 광고가 서빙되는 것을 지정할 수 있다. As another example, in some systems, an advertiser may specify that ads are served if you have a page or search query includes certain keywords or phrases. 다른 실시예로서, 몇몇 실시예들에서, 광고자는 만약 서빙된 문서가 특정 토픽들 또는 개념들을 포함하거나, 특정 클러스터 또는 클러스터들 이하로 떨어지거나, 몇몇 다른 분류 또는 분류들을 포함하면 광고가 서빙되는 것을 지정할 수 있다. As another example, in some embodiments, the advertiser if the serving article comprising or including a fall or some other classification or classifications below a particular cluster or clusters, certain topics or concepts that the ad is served you can specify. "광고 정보"는 광고 특징들, 광고 서빙 제한들, 광고 특징들로부터 유도할 수있는 정보 또는 광고 제한들("광고 유도 정보"라 함), 및/또는 광고와 연관하여 정보("광고 연관 정보"라 함)뿐 아니라, 상기 정보의 확장(예를 들어, 광고 연관 정보로부터 유도된 정보)의 임의의 결합을 포함할 수 있다. "Advertising information" ad features, ad serving constraints, ad features may be derived information or advertising limit from ( "ad derived information" hereinafter), and in connection and / or advertising information (the "Ad association information "hereinafter) as well as, for extension (e.g., of the information, and may include any combination of the information) derived from ad related information. 광고의 인상 수(즉, 광고가 렌더링되는 수)에 대한 광고의 선택수(예를 들어, 클릭을 통해)의 비율은 광고의 "선택 비율"(또는 "클릭 비율")로서 정의된다. Ad impression can be selected for the ad (i. E., The number of the ad is rendered), the proportion of (e. G., Click through) it is defined as "selection ratio" (or "click ratio") of the ad. "대화"는 이용자가 이전에 서비스된 광고와 연관하여 트랙잭션을 통신할 때 발생한다. "Dialogue" is generated when the user is communicating transactions in connection with the advertising service in the past. 대화를 구성하는 것은 경우에 따라 가변하고 다양한 방식으로 결정될 수 있다. What constitutes a conversation varies depending on the case, and may be determined in a number of ways. 예를 들어, 이용자가 광고를 클릭하고, 광고자의 웹 페이지를 참조하여, 상기 웹 페이지를 떠나기 전 구입을 완료할 때 대화가 발생하는 경우일 수 있다. For example, it may be the case that a user clicks on an ad, and the conversation occurred when referring to the advertiser's Web page, complete the purchase before leaving the web page. 대안적으로, 대화는 이용자가 광고를 보고, 미리 결정된 시간(예를 들어, 7일)내에 광고자의 웹 페이지에서 구입을 하는 것으로 정의된다. Alternatively, the dialogue the user to see the advertisement, is defined as the purchase from the advertiser's Web page within a predetermined time (e.g., seven days). 다른 대안에서, 대화는 예를 들어 백지를 다운로딩하고, 웹사이트의 적어도 주어진 깊이로 네비게이팅하고, 적어도 특정 수의 웹 페이지들을 보고, 웹사이트 또는 웹 페이지에서 적어도 미리 결정된 시간 양을 소비하고, 웹사이트에 등록하는 등등 같은 임의의 측정 가능한/관찰 가능한 이용자 행동으로서 광고자에 의해 정의될 수 있다. Alternatively, the dialogue, for example, a blank downloading and navigating to at least a given depth of a Website, at least looking at them a certain number of Web pages, and time-consuming amount of at least a predetermined website or web page, as any measurable / observable user action so as to register on the website can be defined by the advertiser. 종종, 만약 이용자 동작들이 구매 완료를 가리키지 않으면, 비록 대화를 구성하는 이용자 행동들이 이것으로 제한되지 않지만 판매 유도를 가리킬 수 있다. Often, they do not indicate if the user operates the purchase is completed, even though the user does not act that constitute the talk will be limited to the selling point induction. 광고 인상 수(즉, 광고가 렌더링되는 횟수)에 대한 대화 수의 비율은 "대화 비율"이라 한다. The ratio of the number of conversations about the ad impression (that is, the number of times an ad is rendered) is referred to as a "conversation rate." 광고 서빙이후 만약 대화가 미리 결정된 시간내에 발생될 것으로 정의되면, 대화 비율의 하나의 가능한 정의는 과거 미리 결정된 시간 보다 많이 서 빙되었던 광고들만을 고려할 수 있다. Since ad serving if the dialog is defined to occur within a predetermined time, one possible definition of the conversation ratio may consider only the ads that have a lot of standing ice than in the past predetermined time. "문서 정보"는 문서에 포함된 임의의 정보, 문서에 포함된 정보로부터 유도할 수 있는 정보("문서 유도 정보"라 함), 및/또는 문서와 연관하여 정보("문서 연관 정보"라 함)뿐 아니라, 상기 정보의 확장들(예를 들어, 연관된 정보로부터 유도된 정보)를 포함할 수 있다. The term "document information" in connection with any information, (referred to as "document derived information" hereinafter), information derivable from information included in the document, and / or a document included in the document information ( "document related information" means ) as well, the expansion of the information (for example, may include the information) derived from the associated information. 문서 유도 정보의 예는 문서의 텍스트 콘텐트를 기반으로 한 분류이다. An example of document derived information is a classification based on textual content of a document. 문서 연관 정보의 예들은 인스턴트 문서에 링크를 가진 다른 문서들로부터의 문서 정보뿐 아니라, 인스턴트 문서가 링크한 다른 문서들로부터 문서 정보를 포함한다. Examples of document related information include, as well as document information from other documents with links to the instant document, and a document information from other documents by the instant document links. 문서로부터의 콘텐트는 "콘텐트 렌더링 애플리케이션 또는 장치"에서 렌더링될 수 있다. Content from a document may be rendered on a "content rendering application or device". 콘텐트 렌더링 애플리케이션들의 예들은 인터넷 브라우저(예를 들어, 익스플로어 또는 넷스케이프), 미디어 플레이어(예를 들어, MP3 플레이어, 리얼네트워크 스트리밍 오디오 파일 플레이어, 등), 뷰어(예를 들어, 어드브 아크로배트 pdf 렌더) 등을 포함한다. Examples of content rendering applications Internet browser (eg, Explorer or Netscape), a media player (eg, MP3 player, RealNetworks streaming audio file player, etc. ), a viewer (eg, Advisor Rove Acrobat pdf It includes rendering) or the like. "콘텐트 소유자"는 문서 콘텐트의 몇몇 특정 권리를 가진 사람 또는 엔티티이다. "Content owner" is a person or entity that has some specific rights of the article content. 콘텐트 소유자는 콘텐트 저자일 수 있다. Content owners can be a content writer. 게다가, 또는 대안적으로, 콘텐트 소유자는 콘텐트를 재생하기 위한 권리들, 콘텐트의 파생 작업들을 준비하기 위한 권리들, 콘텐트 공적으로 콘텐트를 디스플레이하거나 수행할 권리, 및/또는 콘텐트의 다른 미리 기술된 권리들을 가질 수 있다. In addition, or alternatively, a content owner has the right to, the right to prepare derivative works of the content, rights to display or perform the content to the content publicly, and / or other prescribed rights of the content for playing content It may have. 비록 콘텐트 서버가 서빙한 문서들의 문서의 콘텐트 소유자일 수 있지만, 이것을 필수적이지 않다. Although the content server can be the owner of the content of a document serving documents, but this is not essential. "이용자 정보"는 이용자 행동 정보 및/또는 이용자 프로파일 정보를 포함할 수 있다. "User information" may include user behavior information and / or user profile information. "이메일 정보"는 이메일에 포함된 임의의 정보(또한 "내부 이메일 정보"라 함), 이메일에 포함된 정보로부터 유도된 정보 및/또는 이메일와 연관하여 정보뿐 아니라, 상기 정보의 확장들(예를 들어, 연관된 정보로부터 유도된 정보)를 포함할 수 있다. "E-mail information" in conjunction with any information (also referred to as "internal e-mail information") and information and / or yimeilwa derived from the information contained in the e-mail including the e-mail information as well as the expansion of the information (e. g., it may comprise information) derived from the associated information. 이메일 정보로부터 유도된 정보의 예는 이메일 서브젝트 라인으로부터 추출된 용어들로 구성된 검색 질문에 응답하여 리턴된 검색 결과들로부터 추출되거나 유도된 정보이다. An example of information derived from e-mail information is extracted from the search results returned in response to a search query composed of terms extracted from e-mail subject line or derived information. 이메일 정보와 연관하여 정보의 예들은 주어진 이메일의 동일한 전송자에 의해 전송된 하나 이상의 다른 이메일들에 관한 이메일 정보, 또는 이메일 수신부에 관한 이용자 정보를 포함한다. Examples of information in association with the e-mail information include user information relating to e-mail information, or e-mail receiving unit relating to one or more other e-mail sent by the same sender of a given e-mail. 이메일 정보로부터 유도되거나 연관된 정보는 "외부 이메일 정보"라 한다. Information derived from or related email information is referred to as "external e-mail information." 도 1은 본 발명이 이용되는 예시적인 환경들을 도시한다. Figure 1 illustrates exemplary environments in which the present invention is used. 이용자 디바이스("클라이언트" 또는 "클라이언트 장치"라 불림)(150)는 브라우저 설비(마이크로소프트사의 익스플로어 브라우저, 노르웨이의 오페라 소프트웨어사의 오페라 웹 브라우저, AOL/타임 워너로부터의 네비게이터 브라우저, 등등), 이메일 설비(예를 들어, 마이크로소프트사의 아웃룩), 또는 콘텐트를 렌더링하기 위하여 이용된 임의의 다른 소프트웨어 애플리케이션 또는 하드웨어 장치를 포함한다. User device ( "client" or "client device" LA called) (150) browser facilities (Microsoft's Explorer browser, Opera Software's Norway's Opera Web browser, Navigator from AOL / Time Warner, browser, etc. ), e-mail equipment includes any other software application or hardware device used to render (e. g., Outlook from Microsoft), or content. 검색 엔진(120)은 이용자 디바이스들(150)이 문서들의 수집부(예를 들어, 웹 페이지들)를 검색하게 한다. Search engine 120 to search for the user device 150 of the document collection unit (e. G., Web pages). 콘텐트 서버(130)는 이용자 디바이스들(150)이 문서들에 액세스하게 한다. The content server 130 is the user device 150 makes access to the document. 웹 기반 이메일 서버(마이크로소프트 네트워크로부터의 핫메일, 야후 메일, 등등)(140)는 이용자 디바이스들(150)에 이메일 기능을 제공하기 위하여 이용될 수 있다. (Hotmail, Yahoo Mail, etc. from the Microsoft Network) 140, Web-based e-mail server may be used to provide e-mail functionality to user devices 150. The 광고 서버(110)는 이용자 디바이스들(150)에 광고들을 서빙하기 위하여 이용될 수 있다. Ad server 110 may be used to serve ads to user devices 150. The 광고들은 검색 엔진(120)에 의해 제공된 검색 결과들과 연관하여 서빙될 수 있다. Ads may be served in association with search results provided by the search engine 120. 콘텐트 연관 광고들은 콘텐트 서버(130)에 의해 제공된 콘텐트, 및/또는 이메일 서버(140)에 의해 지원된 이메일 및/또는 이메일 설비들에 의한 이용자 디바이스(150)에 연관하여 서빙된다. Content-relevant ads may be served in association to the content, and / or e-mail server 140, the e-mail and / or e-mail to the user equipment device 150 by the support provided by the by the content server 130. 따라서, 광고 서버(110)는 '427 및 '900 애플리케이션들에 기술된 바와같은 콘텐트-연관 광고 서버일 수 있다. Thus, the advertising server 110 of the content, such as those described in the '427 and' 900 applications - may be associated with ad servers. '900 애플리케이션(상기됨)에서 논의된 바와 같이, 광고들은 콘텐트 서버들에 의해 서빙된 문서들로 타켓화될 수 있다. "As discussed in the application 900 (the search), ads may be targeted to the screen of the serving by the content server document. 따라서, 문서들(예를 들어, 기사들, 논의 스레드들, 음악, 비디오, 그래픽들, 검색 결과들, 웹 페이지 리스트들, 등등)에 대한 요구들을 수신하고 상기 요구에 응답하거나 서비스하여 요구된 문서를 검색하는 콘텐트 서버(130)는 광고들을 소비할 수 있다. Thus, the documents received the request for (eg, articles, discussion threads, music, video, graphics, search results, web page lists, etc.) and required response, or services in the requirements document the content server 130 may retrieve the consumption of advertising. 콘텐트 서버(130)는 광고 서버(110)에 광고들에 대한 요구를 제출할 수 있다. The content server 130 may submit a request for ads to the ad server 110. 대안적으로, 또는 게다가, 이용자 디바이스(150)가 상기 요구를 제출할 수 있다. Alternatively, or in addition, the user may device 150 submits the request. 대안적으로, 또는 게다가, 웹 기반 이메일 서버(140)가 상기 요구를 제출할 수 있다. Alternatively, or in addition, a number of Web-based e-mail server 140 submits the request. 상기 요구는 다수의 목표된 광고들을 포함할 수 있다. The request may include a number of target ad. 광고 요구는 문서 요구 정보를 포함할 수 있다. Ad request may include document request information. 이 정보는 문서 자체(예를 들어, 페이지), 문서 또는 문서 요구(예를 들어, 물품들, 비지니스, 컴퓨터들, 예술 영화들, 예술 음악, 등등)의 콘텐트에 해당하는 카테고리 또는 토픽, 문서 요구의 일부 또는 전부, 콘텐트 시대, 콘텐트 타입(예를 들어, 텍스트, 그래픽, 비디오, 오디오, 혼합 미디어, 등등), 지리적 위치 정보, 및 이용자 로컬 시간 정보, 문서 정보 등등을 포함할 수 있다. This information document itself (eg, page) document or a document required for the content (eg, articles in business, computers, arts movies, art music, etc. ), category or topic, a document required some or all of the content age, content type may include (for example, text, graphics, video, audio, mixed media, etc. ), geolocation information, and the user local time information, document information, and so on. 콘텐트 서버(130), 웹 기반 이메일 서버(140), 및/또는 이용자 디바이스(150)는 광고 서버(110)에 의해 제공된 하나 이상의 광고들과 요구된 문서를 결합할 수 있다. The content server 130, Web-based e-mail server 140, and / or user device 150 may be bonded to a document request to one or more of the advertisements provided by the ad server 110. The 문서 콘텐트 및 광고(들)을 포함하는 이런 결합된 정보는 이용자에게 제공을 위하여 문서를 요구한 최종 이용자 디바이스(150)로 전송되고, 및/또는 렌더링된다. This combined information including the document content and advertisement (s) is transmitted to the end user device 150, a request for a document presented to the user, and is / or rendering. 최종적으로, 콘텐트 서버(130) 또는 웹 기반 이메일 서버(140)는 광고들에 관한 정보 및 광고들이 광고 서버(110)에 다시 렌더링되는 방법, 시기, 및/또는 장소(예를 들어, 위치, 클릭 또는 비클릭, 인상 시간, 인상 일, 크기, 대화 또는 비대화, 등등)를 전송할 수 있다. Finally, the content server 130 or Web-based e-mail server 140 information, and the ads are rendered again how, when, and / or place the advertising server 110 of the ads (e. G., Position, click or non-click, you can send the impression time, impression of one, size, conversation, or non, etc.). 대안적으로, 또는 게다가, 상기 정보는 몇몇 다른 수단에 의해 서버(110)에 다시 제공될 수 있다. Alternatively, or in addition, the information may be provided back to the server 110 by some other means. 본 발명에 일관되게, 광고 서버(110)는 광고 수행 정보를 저장할 수 있다. Consistent with the present invention, the ad server 110 may store ad performance information. 검색 엔진(120)은 검색 결과들에 대한 질문들을 수신하고 광고들을 소비할 수 있다. Search engine 120 may receive questions about the results and the consumption of advertising. 응답하여, 검색 엔진은 연관된 검색 결과들(예를 들어, 웹 페이지들의 인덱스로부터)을 검색할 수 있다. In response, the search engine may retrieve the associated search results (eg, from an index of Web pages). 예시적인 검색 엔진은 S.Brin 및 L.Page에 의한 거시며 오스트리아 브리스베인의 Seventh International World Wide Web Conference 에서의 기사 "The anatomy of a Large-Scale Hypertextual Search Engine" 및 미국특허 6,285,999(참조로써 양쪽은 여기에 통합됨)에 기술된다. The exemplary search engine S.Brin and macroeconomic L.Page said articles in Brisbane Austria Seventh International World Wide Web Conference by "The anatomy of a Large-Scale Hypertextual Search Engine" and US Patent 6,285,999 (both of them as a reference It is described in the incorporated here). 상기 검색 결과들은 예를 들어, 웹 페이지 제목들의 리스트들, 웹 페이지들로부터 추출된 텍스트의 발췌, 및 상기 웹 페이지들에 대한 하이퍼텍스트 링크들을 포함할 수 있고, 미리 결정된 다수(예를 들어, 10) 검색 결과들로 그룹화될 수 있다. The search results may include, for example, may include hypertext links to the extract, and the web page of text extracted from the lists of Web page titles, web page, a predetermined number (e.g., 10 ) it may be grouped into search results. 검색 엔진(120)은 광고 서버(110)에 광고들에 대한 요구를 제출할 수 있다. Search engine 120 may submit a request for ads to the ad server 110. 요구는 다수의 목표된 광고들을 포함할 수 있다. Requirements can include a plurality of target ads. 이런 다수의 광고들은 검색 결과들, 검색 결과들에 의해 차지되는 스크린 양 또는 페이지 공간, 광고들의 크기 및 모양, 등등에 따를 수 있다. These ads may be subject to a number of search results, screen positive or page space occupied by the search results, the size and shape of the ads and so on. 일실시예에서, 다수의 목표된 광고들은 1에서 10 사이이고, 바람직하게 3 내지 5이다. In one embodiment, a plurality of target advertisements and between 1 and 10, preferably 3 to 5. 광고들에 대한 요구는 질문(입력 또는 분석됨), 질문을 기반으로 하는 정보(최종 이용자 로컬 시간 정보, 지리적 위치 정보, 질문이 가입자로부터 왔는지 가입자의 식별자로부터 왔는지 여부), 및/또는 검색 결과들과 연관되거나 기반으로 하는 정보를 포함할 수 있다. Request for ads is the question (as input or analysis), (whether it came from the end user local time information, geolocation information, questions came from a subscriber from the Subscriber Identity) information based on the questions and / or search results associated with, or may include information that is based on. 상기 정보는 예를 들어 검색 결과들과 연관된 식별자들(예를 들어, 문서 식별자들 또는 "docID"들), 검색 결과들와 연관하여 스코어들(예를 들어, 질문 및 문서에 해당하는 특징 벡터들의 내적들 같은 정보 검색("IR") 스코어들, 페이지 랭크 스코어들, 및/또는 IR 스코어들 및 페이지 랭크 스코어들의 결합들), 식별된 문서들로부터 추출된 텍스트의 발췌부(예를 들어, 웹 페이지들), 식별된 문서들의 전체 텍스트, 식별된 문서들의 토픽들, 식별된 문서들의 특징 벡터들, 등등을 포함할 수 있다. The above information, for example, identifiers related to the search results (e.g., document identifiers or "docID") dot products of, Browse the deulwa in relation to the game (e.g., a feature that corresponds to the query and document vectors the same search ( "IR") scores, page rank scores, extracted portion of text extracted from, and / or IR scores and a combination of page rank scores), the identified documents (e.g., Web pages s), the topic of the full-text, the identification document of the identified documents, the feature vectors of identified documents, may include and so on. 검색 엔진(120)은 광고 서버(110)에 의해 제공된 하나 이상의 광고들과 검색 결과들을 결합할 수 있다. Search engine 120 may combine one or more of the advertisements provided by the ad server 110 and the search results. 검색 결과들 및 광고(들)을 포함하는 이런 결합된 정보는 이용자에게 제공을 위하여 검색이 제출된 이용자에게 전송된다. This combined information including the search results and advertisement (s) in order to provide to the user is sent to a user's search submission. 바람직하게, 검색 결과들은 지불된 광고들 및 아마도 중립적인 검색 결과들 사이에서 이용자에게 혼란을 주지 않기 위하여 광고들과 별개로서 유지된다. Preferably, the search results are maintained as distinct from the ads not to give confusing to users among those in paid advertisements and presumably neutral search results. 마지막으로, 검색 엔진(120)은 광고에 관한 정보 및 광고가 광고 서버(110)에 다시 렌더링된 시기(예를 들어, 최종 이용자 로컬 타임), 장소(예를 들어, 지리적 위치), 및/또는 방법(예를 들어, 위치, 클릭 또는 비클릭, 인상 시간, 인상 일, 크기, 대화 또는 비대화, 등등)을 전송할 수 있다. Finally, the search engine 120 has the information and time the ad is rendered again to the ad server 110 of the ads (e. G., End user local time), location (e.g., geographic position), and / or method may send a (e. g., position, click or click ratio, impression time, impression days, size, or non-interactive conversation, and so on). 대안적으로, 또는 게다가, 상기 정보는 몇몇 다른 수단에 의해 광고 서버(110)에 다시 제공될 수 있다. Alternatively, or in addition, the information may be provided back to the ad server 110 by some other means. 웹 기반 이메일 서버(140)는 서빙된 문서가 단순히 이메일인 콘텐트 서버로서 일반적으로 생각된다. Web-based e-mail server (140) is generally thought of as serving the document simply email content server. 게다가, 이메일 애플리케이션들(예를 들어 마이크로소프트 아웃룩 같은)은 이메일을 전송하고 및/또는 수신하기 위하여 이용될 수 있다. In addition, the e-mail application (e.g., such as Microsoft Outlook) can be used to send an email and / or received. 그러므로, 웹 기반 이메일 서버(140) 또는 클라이언트 장치(150) 애플리케이션은 광고 소비자로서 생각될 수 있다. Therefore, a web-based e-mail server 140 or client device 150, the application can be thought of as an ad consumer. 따라서, 이메일들은 문서들로서 생각되고, 타켓화된 광고들은 상기 문서들과 연관하여 서빙될 수 있다. Therefore, they are considered as email documents, the target screen ads may be served in association with the document. 예를 들어, 하나 이상의 광고들은 이메일과 연관하여 서빙될 수 있다. For example, one or more ads may be served in association with e-mail. 본 발명이 이메일로 제한되지 않고, 오히려 온라인 그룹들, 블로그들, 다른 온라인 메시지 포스팅(posting)들, 인스턴트 메시징 등등 같은 다른 종류의 전자 메시징 방법으로 실행될 수 있다는 것은 당업자에게 명백하다. The fact that the invention is not limited to e-mail, but rather can be performed online groups, blogs, and other online message postings (posting), other types of electronic messaging methods, such as instant messaging, etc. It is obvious to a person skilled in the art. 다양한 서버들은 예를 들어 인터넷 같은 하나 이상의 네트워크들(160)을 통하여 정보를 교환할 수 있다. Various servers, for example, to exchange information through one or more networks such as the Internet 160. 본 발명과 일관되게, 이메일 서버(일반성의 손실없이 "웹 기반 이메일 서버"로서 명세서에서 언급됨)는 두 개의 스테이지들 - "콘텐트" 스테이지, 및 "광고" 스테이지에서 문서(일반성 손실없이 "웹 페이지"로서 명세서에서 언급됨)를 서빙함으로써 콘텐트 렌더링 애플리케이션(일반성 손실없이 "웹 브라우저"로서 명세서에서 언급됨)과 상호작용할 수 있다. Consistent with the present invention, the e-mail server (referred to herein as a "Web-based e-mail server" without loss of generality) has two stages - "content" stage, and "advertising" document (without generality loss "Web page on the Stage referred to herein as a web browser "" referred to herein as) a content rendering application (without loss of generality, by serving ") and can interact. 이들 스테이지들 각각의 몇몇 부분들은 다른 스테이지의 부분들의 수행과 무관하게 실행할 수 있다. Some parts of each of these stages may execute independent of the performance of parts of the other stage. 이들 스테이지들 각각의 예들은 하기에 기술된다. For each of these stages are described below. 콘텐트 스테이지는 하나 이상의 이메일 바디들을 포함하는 웹 페이지를 디스플레이하기 위하여 통상적으로 웹 브라우저에서의 요구에서부터 시작할 수 있다. Content stages are normally able to start from a request from the Web browser to display a Web page that contains one or more e-mail body. 웹 기반 이메일 서버는 두 개의 스레드들 -콘텐트 서빙 스레드 및 광고 획득 스레드-을 실행할 수 있다. Web-based e-mail server, two threads - can run - content serving thread and ad acquisition thread. 응답 생성 전 후 또는 동안, 웹 기반 이메일 서버는 (ⅰ) 연관된 광고들(예를 들어, 이용자의 서명 또는 어드레스로부터/어드레스쪽으로가 아닌 서브젝트 및 바디)을 선택하기 위해 소스 콘텐트를 포함할 수 있는 이메일 바디의 섹션들을 식별하고, (ⅱ) 이러한 특정 요구를 식별하는 고유 식별자(일반성을 손상하지 않고 명세서에서 "지문"이라 함)를 생성하고, (ⅲ) 광고 획득 스레드에 지문 및 소스 콘텐트를 제공하고, (ⅳ) 광고 획득 스레드를 시작하고, 및 (ⅴ) 콘텐트 스레드하에서 지문의 카피를 포함하는 요구된 페이지를 계속 서빙할 수 있다. After the response generated before or during the web-based e-mail server (ⅰ) associated ad in an email which may include a source content to select (for example, rather than signatures or addresses to / from addresses into the user's subject and body) identifying a section of the body and, (ⅱ) (in the specification without damaging the generality referred to as "fingerprint") unique identifier identifying this particular request generate and, (ⅲ) provide the fingerprint and source content to the ad acquisition thread, and , (ⅳ) can begin advertising and acquisition thread, and continue serving the requested page containing a copy of the fingerprints under (ⅴ) content thread. 광고 획득 스레드하에서, 웹 기반 이메일 서버는 콘텐트-연관 광고 서버(CAS)가 소스 콘텐트에 대한 적당한 광고들을 제공하는(예를 들어, CAS에 대한 모든 원격 과정(RPC)을 실행할 수 있음) 것을 요구할 수 있다. Under the ad acquisition thread, a Web-based e-mail server is a content-relevant ad server (CAS) is to provide an appropriate ad for the source content (for example, that you can run any remote procedure (RPC) to the CAS) may require that have. 이런 RPC는 완료하는데 수억 밀리초가 걸리거나, 전체적으로 실패할 수 있다. This RPC can take hundreds of milliseconds, or failure to complete a whole. 만약 요구가 너무 길어지면, 상기 요구는 종료되고, 광고 획득 스레드는 비어있는 결과로 빠져나갈 수 있다. If the ground is too long and needs, the demands can get terminated and, as a result of missing the ad acquisition thread is empty. 만약 요구가 성공하면, 광고 획득 스레드는 그 결과를 얻을 수 있고, 상기 결과는 하나 이상의 타켓화된 광고들의 콘텐트를 포함한다. If the request is successful, the ad acquisition thread may get the results, the results include the contents of one or more of the targeted ad Tuesday. 웹 기반 이메일 서버는 하나 이상의 광고들을 이용자의 웹 브라우저에 전달하는데 편리한 포맷으로 전환할 수 있다. Web-based e-mail server can be converted into a useful format for transferring one or more ads in the user's Web browser. 웹 기반 이메일 서버는 하나 이상의 광고들(예를 들어, 저장된 하나 이상의 광고들이 지문을 이용하여 검색될 수 있도록 일차 키로서 서빙하는 지문을 가진 룩업 테이블에서)을 저장할 수 있다. Web-based e-mail server can store (in a look-up table with a fingerprint that serves as a primary key for example, stored in one or more ads may be retrieved using a fingerprint) one or more ads. 최종적으로, 광고 획득 스레드를 빠져나간다. Finally, the ad acquisition thread exits. 웹 기반 이메일 서버가 브라우저로부터 광고 스테이지 요구를 수신할 때, 룩업 테이블에서 연관된 하나 이상의 광고들을 찾기 위하여 지문을 이용할 수 있다. When the web-based e-mail server receives the ad request from the browser to the stage, and a fingerprint can be used to find them associated with one or more ads in the lookup table. 만약 웹 기반 이메일 서버가 상기 요구에 해당하는 테이블에서 엔트리를 찾으면, 테이블에 이미 저장된 결과를 리턴하거나, 요구가 완료되는 동안 차단(기다림)한다. If the Web-based e-mail server finds an entry in the table corresponding to the request, and returns the results already stored in the table, or to block (wait) while the request completes. 이런 시점에서 차단은 이메일 콘텐트를 포함하는 웹 페이지 부분이 이용자의 브라우저에서 이미 렌더링되었기 때문에 수용된다는 것이 주의된다. From this point it is noted that the block is acceptable because the Web page that contains part of the email content has already been rendered in the user's browser. 일단 요구된 광고(들)이 이용 가능하면, 웹 기반 이메일 서버는 이에 응답한다. Once you have enabled the required ad (s) available, web-based e-mail server will respond to. 선택들은 상기된 '427, '900, '607 및 '830 출원에 기술된 바와 같이 다양한 방식으로 추적될 수 있다. Selection can be tracked in a variety of ways as described in the application 830 the '427,' 900, '607, and'. 도 2는 본 발명에 일관된 방식으로 광고들을 서빙하기 위하여 (웹 기반 이메일) 콘텐트 서버에 의해 이용될 수 있는 예시적인 방법(200)의 흐름도이다. 2 is a flow chart of an example method that may be used by the content server (Web-based e-mail) to serve ads in a manner consistent with the present invention (200). 블록(205)에 의해 표시된 바와 같이, 방법(200)의 다양한 가지들은 다양한 이벤트들에 응답하여 수행될 수 있다. Variety of ways, as indicated by the block 205, 200 may be performed in response to various events. 예를 들어, 만약 이메일 웹 페이지 요구가 수신되면, 상기 방법(200)은 하나 이상의 스레드들을 실행할 수 있다. For example, if the e-mail when a Web page request is received, the method 200 may execute one or more threads. 특히, 방법(200)은 요구된 웹 페이지에서 콘텐트 연관 정보를 추출하고 및/또는 유도하고(블록 210) 및 고유 요구 식별자(unique request identifier)(일반성을 손실하지 않고 명세서에서 "요구 지문(request fingerprint)"이라 함)가 생성된다(블록 215). In particular, the method 200 is in no loss to extract content-relevant information in the requested web page, and / or derived (block 210), and a unique request identifier (unique request identifier) ​​(generality terms "request fingerprint (request fingerprint ) "it is generated quot;) (block 215). 상기 방법(200)의 하나 이상의 스레드들이 콘텐트-연관 광고 서버로부터 하나 이상의 광고들을 요구하기 위하여 이용되고(블록 220) 타임아웃 타이머를 시작하고(블록 230), 동시에 요구가 발생한 브라우저에 요구 지문을 가진 웹 페이지를 서빙한다(블록 235). One or more threads of the method 200 are the content-associated and used to request one or more ads from the ad server (block 220) starts a timeout timer (Block 230), simultaneously with the request fingerprint to the browser request occurred and serving a web page (block 235). 그 다음 상기 방법(200)은 이벤트 블록(205)으로 리턴한다. Then the method 200 returns to event block 205. 따라서, 방법(200)의 좌측 보조 가지는 광고 획득 스레드에 대응하고, 방법(200)의 우측 보조 가지는 콘텐트 서빙 스레드에 해당할 수 있다. Thus, the right satellite of a method corresponding to the ad acquisition thread, and the left side auxiliary with the 200 method 200 has can correspond to a content serving thread. 이벤트 블록(205)을 다시 참조하여, 만약 하나 이상의 광고들이 검색되면(예를 들어, 요구 220에 응답하여), 타임아웃 타이머는 정지되고(블록 260) 요구된 하나 이상의 광고들이 수용된다(블록 265). When referring to event block 205 again, if one or more ads are to search (e.g., in response to a request 220), the timeout timer is stopped and the receiving one or more ads (block 260) requests (block 265 ). 만약 필요하면, 광고들은 다시 포맷될 수 있다(예를 들어, 광고들이 웹 페이지에 렌더링될 수 있도록)(블록 270). If necessary, ads may be reformatted (for example, so that the ads are to be rendered on the web page) (block 270). 그 다음 하나 이상의 광고들이 저장될 수 있다(예를 들어, 광고들을 찾기 위한 일차 키로서 이용된 요구 지문을 이용하여 테이블에서)(블록 275). That can be the following one or more ads are stored (e.g., in a table by using the request fingerprint used as a primary key to find ads) (Block 275). 그 다음 방법(200)이 이벤트 블록(205)으로 리턴한다. Next, the method 200 returns to event block 205. 이벤트 블록(205)을 다시 참조하여, 만약 요구 지문(블록 235를 상기함)을 포함하여야 하는 광고 요구가 검색되면, 요구된 광고(들)이 검색된다(예를 들어, 요구 지문은 이전에 저장된 하나 이상의 광고들을 찾기 위하여 이용된다)(블록 240). Referring to event block 205 again, if required when the fingerprint search ad request should include (also the block 235), the requested ad (s) are retrieved (e. G., Request fingerprint is a previously stored It is used to find one or more ads) (block 240). 만약 광고(들)이 발견되면, 광고들은 요구 브라우저로 리턴된다(블록 245 및 255). If the advertisement (s) is found, the ad can be returned to the requesting browser (blocks 245 and 255). 만약 다른 한편, 광고(들)이 발견되지 않으면, 타임아웃 타이머가 경과되었는지 여부가 결정된다(블록 245 및 250). If on the other hand, if the advertisement (s) is not found, it is determined that whether the timeout timer has elapsed (block 245 and 250). 만약 경과되지 않으면, 방법(200)은 블록(250)으로 다시 갈라진다(아마도 지연후). If not passed, the method 200 is again divided into blocks (250) (possibly after a delay). 광고들을 기다리는 다른 방법들이 이용될 수 있다. Other methods waiting for ads to be used. 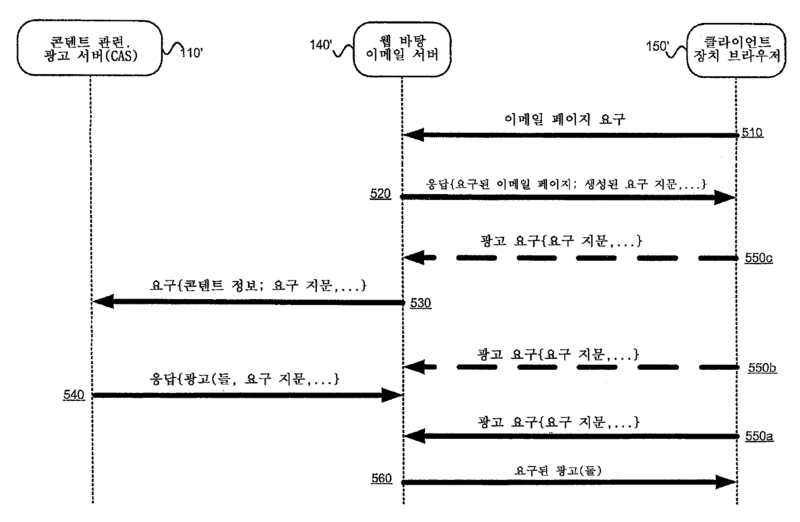 만약 다른 한편, 타이머가 경과되면, 에러 이벤트는 방법(200)을 떠나기 전(노드 290) 정책(블록 285)에 따라 처리될 수 있다. If on the other hand, when the timer has elapsed, an error event may be processed in accordance with the before leaving (node ​​290), policy (block 285), the method 200. 이벤트 블록(205)에 대한 하나의 최종 시간을 참조하여, 만약 타임아웃 타이머가 경과되면, 에러 이벤트는 방법(200)을 떠나기전(노드 290) 정책(블록 285)에 따라 처리될 수 있다. When referring to one of the end time of the event block 205, if the time-out timer has elapsed, an error event may be processed in accordance with the before leaving (node ​​290), policy (block 285), the method 200. 블록(235)을 다시 참조하여, 웹 페이지는 하나 이상의 이메일 바디들을 포함할 수 있다. With reference to the block 235 again, the Web page may include one or more e-mail bodies. 블록(210)을 다시 참조하여, 콘텐트 연관 정보는 콘텐트 연관 광고들을 서빙할 수 있게 하도록 콘텐트-연관 광고 서버에 의해 이용된 정보일 수 있다. The information may be used by the relevant ad server with reference to the block 210 again, content-relevant information content to allow the serving of content-relevant ads. 예를 들어, 연관 광고들(예를 들어, 아마도 이용자의 서명이나 전송자 및 수신부 어드레스들이 아닌 서브젝트 및 바디)을 선택하기 위한 소스 콘텐트를 포함할 수 있는 이메일 바디들의 섹션이 추출될 수 있다. For example, a relevant ad in section E of the body, which may include a content source to select (for example, perhaps the signature and the sender and receiver addresses are instead subject and body of the user) it can be extracted. 블록(220)을 다시 참조하여, 요구는 콘텐트-연관 광고 서버에 원격 절차 호출(RPC)일 수 있고, 소스 콘텐트에 적당한 광고들을 요구한다. Referring to block 220 again, the request content - may be a remote procedure call (RPC) to the relevant ad server, it requires adequate advertising to the source content. 이런 RPC는 완료하는데 수억 밀리초가 걸릴거나, 완전히 실패할 수 있다. This RPC can take hundreds of milliseconds, or can completely fail to complete. 만약 RPC가 너무 오래 걸리면, 광고 획득 스레드는 삭제될 수 있고 비어있는 결과로 남겨질 수 있다. If the RPC takes too long, the ad acquisition thread may be left with results that can be deleted is empty. 따라서, 블록들(230,250 및 285)을 다시 참조하여, 타임아웃 타이머는 미리 결정된 시간으로 설정될 수 있다. Thus, with reference to the blocks (230 250 and 285) in the back, the timeout timer may be set to a predetermined time. 본 발명에 일관된 적어도 하나의 실시예에서, 미리 결정된 시간은 약 0.5 초 내지 2초(예를 들어, 약 1,250 밀리초)의 시간일 수 있다. In the present invention, consistent at least one embodiment, a may be a predetermined time is a time of about 0.5 seconds to about 2 seconds (e. G., About 1,250 milliseconds). 유사하게 만약 RPC가 실패하면, 광고 획득 스레드는 비어있는 결과로 남겨질 수 있다. Similarly, if RPC has failed, the ad acquisition thread may be left empty as a result. 만약 RPC가 성공하면, 광고 스레드는 광고 획득 스레드가 떠나가기 전에 광고(들)을 수용하고, 다시 포맷하고, 저장한다. If the RPC is successful, Advertising thread accommodate ad (s), reformat, and save the ad acquisition thread before leaving. 블록(245)을 다시 참조하여, 만약 웹 기반 이메일 서버가 요구된 광고(들)을 발견하면, 테이블에 이미 저장된 광고(들)을 리턴하거나, 요구가 완료되는 동안 차단된다. Referring to block 245 again, if you find a web-based email server (s) requested ads and returns the previously stored ad (s) in the table, or is blocked while the request completes. 이 시점에서 차단은 이메일 콘텐트를 포함하는 웹 페이지의 일부가 이용자의 브라우저상에서 이미 렌더링되었기 때문에 수용 가능하다는 것이 주의된다. At this point, the block is noted that it is acceptable because the part of the Web page that contains the e-mail content has already been rendered on the user's browser. 따라서, 블록들(240,245 및 250)을 참조하여, 일단 요구된 광고(들)이 이용 가능하면, 웹 기반 이메일 서버는 브라우저 요구에 응답할 수 있다. Thus, with reference to the block (240,245 and 250), if possible one required advertisement (s) to use, web-based email server can respond to a browser request. 도 3은 본 발명과 일관된 방식으로 이메일에 콘텐트 연관 광고들을 렌더링하기 위하여 클라이언트 장치 브라우저에 의해 이용될 수 있는 예시적인 방법(300)의 흐름도이다. 3 is a flow chart of an example method that may be used by the client device browser 300 to render content-relevant ads with e-mail in a manner consistent with the present invention. 블록(310)에 도시된 바와 같이, 방법(300)의 다양한 가지들은 다양한 이벤트들에 응답하여 수행될 수 있다. Various branches of the method 300, as shown in block 310 may be performed in response to various events. 예를 들어, 만약 요구된 페이지가 수신되면, 수신된 페이지는 렌더링되고(블록 320), 하나 이상의 광고들은 요구될 수 있다(예를 들어, 웹 기반 이메일 서버로부터)(블록 330). For example, if the requested page has been received, the received page is rendered (Block 320), one or more ads may be requested (e. G., From the Web-based e-mail server) (Block 330). 그 다음 방법(300)은 이벤트 블록(310)으로 리턴한다. Next, the method 300 returns to event block 310. 이벤트 블록(310)을 다시 참조하여, 만약 하나 이상의 광고들이 수신되면, 광고들은 만약 필요하면 포맷되고(블록 340), 렌더링된다(블록 350). When referring to event block 310. Again, if one or more ads are received, ads are formatted if necessary (block 340), and rendered (Block 350). 그 다음 방법(300)은 이벤트 블록(310)으로 리턴한다. Next, the method 300 returns to event block 310. 광고(들)이 이메일 콘텐트와 연관하여 렌더링될 수 있는 블록(350)을 상기하자. Recall advertisement (s) block 350 that can be rendered in connection with the e-mail content. 본 발명과 일관된 적어도 하나의 실시예에서, 하나 이상의 광고는 이메일 메시지(또는 이메일 메시지 바디) "다음"에 렌더링되지만, 실제 이메일 메시지의 부분은 아니다. In the present invention, consistent with at least one embodiment, but one or more ads are rendered in the "next" e-mail message (or e-mail message body), it is not part of the actual e-mail messages. 야후, 핫메일 등과 달리, 수신부 이용자가 이메일을 볼 때, 그들이 보고 있는 이메일 메시지와 연관하여 하나 이상의 광고들을 볼 수 있지만, 그 하나 이상의 광고들은 이메일 메시지(또는 이메일 메시지 바디)를 변경하지 않고, 또는 이메일 메시지의 일부가 되지도 않는다. Unlike Yahoo, Hotmail, when receiving the user to view the e-mail, you can view one or more ads associated with email messages they are seeing, but without changing the one or more advertisements e-mail message (or e-mail message body), or email nor it is part of the message. 몇몇 다른 시스템들에서는, 광고들은 실제로 이메일의 일부가 되고, 그러므로 이메일 메시지 자체를 변경한다. In some other systems, the ads are actually being part of the email, and therefore change the email message itself. 상기 시스템들에서, 메시지가 재전송될 때, 다른 수신부들(예를 들어 야후 메일을 이용하지 않을 수 있는 사람)은 광고들로 인해 부담을 받을 것이다. In the system, when the message is retransmitted to another receiver (for example, people who can not use Yahoo mail) will be paid because of the advertising. 또한, 메시지들에서 이러한 광고들의 존재는 다른 단부(end)에서의 원하지 않는 스팸 검출/필터링 메카니즘들을 유발할 수 있다. In addition, the existence of such ads in messages may result in the unwanted spam detection / filtering mechanisms that are at the other end (end). 본 발명의 적어도 하나의 이런 실시예에서는, 이들 문제들이 방지될 수 있다. In this embodiment at least one of the present invention, these problems can be prevented. 도 4는 상기된 하나 이상의 동작을 수행할 수 있는 기계(400)의 높은 레벨 블록도이다. Figure 4 is a high level block diagram of a machine 400 that may perform one or more operations described above. 하나 이상의 상기 기계들(400)은 콘텐트-연관 광고 서버, 독립된 서버, 클라이언트 장치들, 등등으로서 이용될 수 있다. One or more of the machine 400 includes a content-relevant ads may be used as a server, and a separate server, client devices, and so on. 기계(400)은 기본적으로 하나 이상의 처리기들(410), 하나 이상의 입력/출력 인터페이스 유니트들(430), 하나 이상의 저장 장치들(420), 및 결합된 엘리먼트들 사이에서 정보의 통신을 촉진하기 위한 하나 이상의 시스템 버스들 및/또는 네트워크들(440)을 포함한다. Machine 400 is basically the one or more processors 410, one or more input / output interface unit to 430, one or more storage devices 420, and between the coupling element to facilitate the communication of information It includes one or more system buses and / or networks 440. 하나 이상의 입력 장치들(432) 및 하나 이상의 출력 장치들(434)은 하나 이상의 입력/출력 인터페이스들(430)과 결합될 수 있다. One or more input devices 432 and one or more output devices 434 may be combined with one or more input / output interfaces 430. 하나 이상의 처리기들(410)은 본 발명의 하나 이상의 측면들을 달성하기 위하여 기계 판독 가능 명령들(예를 들어, 캘리포니아주 팔로 알토시의 선 마이크로시스템 인코포레이트에서 판매되는 Solaris 오퍼레이팅 시스템에서 동작하는 C 또는 C++ 또는 노쓰 캘리포니아주 던햄시의 Red Hat, Inc 같은 다수의 판매인들로부터 폭넓게 판매되는 리눅스 오퍼레이팅 시스템)을 실행할 수 있다. One or more processors 410 C operating in a machine-readable instructions (e. G., Palo Alto, California, when Solaris operating system sold by, Inc. rate Sun Microsystems in order to achieve the one or more aspects of the present invention or you can run the Red Hat, Inc multiple Linux operating system widely available from the same seller) when C ++ or North California, Dunham. 기계 판독 가능한 명령들의 적어도 일부는 하나 이상의 저장 장치들(420)에 저장될 수 있고(일시적으로 또는 보다 영구적으로) 하나 이상의 입력 인터페이스 유니트들(430)을 통하여 외부 소스로부터 검색될 수 있다. At least a portion of the machine readable instructions may be retrieved from an external source via a may be stored in one or more storage devices 420, one or more input interface units (temporarily or more permanently) 430. 하나의 실시예에서, 기계(400)은 하나 이상의 종래 개인용 컴퓨터들일 수 있다. In one embodiment, the machine 400 may be one or more conventional personal computers. 이 경우, 처리 유니트들(410)은 하나 이상의 마이크로프로세서들일 수 있다. In this case, the processing unit 410 may be one or more microprocessors. 버스(440)는 시스템 버스를 포함할 수 있다. Bus 440 may include a system bus. 저장 장치들(420)은 판독 전용 메모리(ROM) 및/또는 랜덤 액세스 메모리(RAM) 같은 시스템 메모리를 포함할 수 있다. The storage device 420 may include system memory, such as read only memory (ROM) and / or random access memory (RAM). 저장 장치들(420)은 하드 디스크로부터 판독하고 기입하기 위한 하드 디스크, (예를 들어, 제거 가능한) 자기 디스크로부터 판독 또는 기입하기 위한 자기 디스크 드라이브, 및 컴팩트 디스크 또는 다른 (자기) 광학 매체 같은 제거 가능한(자기) 광학 디스크로부터 판독 또는 기입하기 위한 광학 디스크 드라이브를 포함할 수 있다. The storage device 420 is a hard disk, for reading and writing from the hard disk (e. G., Removable) magnetic magnetic disk drive to read or write from the disk, and a compact disk or other removal of (magnetic), an optical medium possible (magnetic) may include an optical disk drive for reading from or writing to the optical disc. 이용자는 예를 들어 키보드 및 포인팅 장치(예를 들어, 마우스) 같은 입력 장치들(432)을 통하여 개인용 컴퓨터에 명령 및 정보를 입력할 수 있다. A user may enter commands and information into the personal computer, for example via a keyboard and pointing device (e.g., mouse) of the same input device 432. 마이크로폰, 조이스틱, 게임 패드, 위상 접시, 스캐너, 또는 유사한 것 같은 다른 입력 장치들은 (또는 대안적으로) 포함될 수 있다. A microphone, a joystick, a game pad, a phase plate, a scanner, or other input devices may be included, such as similar to (or alternatively). 이들 및 다른 입력 장치들은 시스템 버스(440)에 결합된 적당한 인터페이스(430)를 통하여 처리 유니트(들)(410)에 접속된다. These and other input devices are connected to the system bus 440, processing unit (s) 410 through an appropriate interface 430 coupled to. 출력 장치들(434)은 적당한 인터페이스를 통하여 시스템 버스(440)에 접속될 수 있는 모니터 또는 다른 종류의 디스플레이 장치를 포함할 수 있다. Output device 434 may include a monitor or other type of display device, which can be connected to the system bus 440 via an appropriate interface. (또는 대신) 모니터 외에, 개인용 컴퓨터는 예를 들어 스피커들 및 프린터들 같은 다른 (주변) 출력 장치들(도시되지 않음)을 포함할 수 있다. In addition to the monitor (or instead), the personal computer may, for example include other (peripheral) output devices such as speakers and printers (not shown). 각각의 웹 기반 이메일 서버(140), 이용자 디바이스(150) 등등은 하나 이상의 상기 기계들(400)로 구현될 수 있다. Each of the Web-based e-mail server 140, the user device 150 and so on may be implemented in one or more of the machines (400). 비록 상기된 실시예들이 다양한 정보를 연관시키기 위하여 고유 식별자 또는 지문을 이용하였지만, 부가적인 식별자들을 이용하여 생성된 묶음들 또는 연관물들은 이용될 수 있다. Although the above embodiments may be used or a unique identifier used, but a fingerprint, the waters that are bundled or association created using additional identifiers to associate various information. 예를 들어, 요구 지문은 만약 요구되면 콘텐트-연관 광고 서버로 전송될 필요가 없을 수 있고 응답은 한번에 행해질 수 있다. For example, the fingerprint is required if the required content - may not need to be sent to the ad server and associated responses can be done at once. 비록 콘텐트 연관 광고들이 상기된 몇몇 예시적인 실시예들에서 (예를 들어, 개별) 이메일의 콘텐트로 타켓화될지라도, 본 발명에 일관된 실시예들은 이메일들의 몇몇 그룹 또는 수집부로부터 콘텐트 같은 일반적으로 이메일 콘텐트로 타켓화된 콘텐트 연관 광고들이 이용될 수 있다. Although the content-relevant ads are (e. G., Individual) in the a few exemplary embodiments even if the target screen to the content of the email, consistent embodiment to the present invention are e-mail to the content, such as generally from section some group or collection of e-mail there are a target screen content associated with advertising content can be used. 예를 들어, 이메일 콘텐트는 연관된 메시지들의 스레드에 속하는 (예를 들어, 모든) 이메일들의 그룹으로부터의 콘텐트를 포함할 수 있다. For example, e-mail content can include (eg, all) content from the group of emails that belong to a thread of related messages. 다른 실시예로서, 이메일 콘텐트는 발명자가 Paul Buchheit 등이고, 각각 2004년 3월 31일 출원되고, 발명의 명칭이 각각 "EMAIL SYSTEM WITH CONVERSATION-CENTRIC USER INTERFACE" 및 "EMAIL CONVERSATION MANAGEMENT SYSTEM"이고 위임 도킷 번호가 GP-281-00-PR 및 GP-281-01-PR이고 미국특허 출원 번호가 ##/###,### 및 ##/###,###(여기에 참조로써 통합됨)에 기술된 바와같은 "대화 뷰"로부터의 콘텐트를 포함할 수 있다. In another embodiment, the e-mail content is the like inventor Paul Buchheit, each of which is filed on March 31, 2004, entitled & respective "EMAIL SYSTEM WITH CONVERSATION-CENTRIC USER INTERFACE" and "EMAIL CONVERSATION MANAGEMENT SYSTEM", and delegates dokit number the GP-281-00-PR, and GP-281-01-PR, and United States Patent Application number ## / ###, ### and ## / ###, ### (incorporated herein by reference) the "dialog view" as described may include the content from. 따라서, 콘텐트 연관 광고 타켓팅은 필수적으로 단일 개별 이메일 메시지를 위한 것이 아니고, 다수의 이메일 메시지들을 위한 것이다. Thus, the content-relevant ad targeting essentially not for a single individual email messages, but for a large number of email messages. 본 발명에 일관되는 적어도 몇몇의 실시예에서, 광고 서버(110)는 인터넷상 장치들에 액세스 가능하지 않고, 이메일 서버(140)와 직접 상호작용한다. In at least some embodiments consistent with the present invention the, ad server 110 directly interacts with the Internet device, email server 140 does not enable access to. 따라서, 네트워크들(160)은 사적 네트워크를 포함하고나, 이메일 서버(140) 및 광고 서버(110)가 통신할 수 있는 가상 사적 네트워크(VPN)를 포함할 수 있다. Thus, the networks 160 may comprise a virtual private network (VPN), which may include a private network, or a, e-mail server 140 and ad server 110 communication. 발명자가 Alex Roetter 및 Deepak Jindal이고(위임 도킷 번호 0026-0040) 2003년 9월 4일 출원된 발명의 명칭이 "SYSTEMS AND METHOD FOR DETERMINING USER ACTIONS"인 미국특허출원 10/653,899(여기에 참조로서 통합됨)에 기술된 바와같은 이용자 행동들을 결정하기 위한 다른 방법들은 상기 기술된 기술들 대신, 또는 부가하여 이용될 수 있다. And inventor Alex Roetter and Deepak Jindal (delegate dokit No. 0026-0040), the title of the invention the filed September 4, 2003 "SYSTEMS AND METHOD FOR DETERMINING USER ACTIONS" U.S. Patent Application No. 10/653 899 (incorporated herein by reference ) the other method for determining user actions, such as those described herein may be used in place of the above-described techniques, or addition. 다른 콘텐트 연관 정보는 콘텐트 연관 광고들 대신, 또는 부가하여 렌더링될 수 있다. Other content-relevant information can be rendered to, or instead add the content-relevant advertisements. 상기 "다른 콘텐트"는 제안된 질문들(예를 들어, "___ 검색 시도"), 뉴스 기사들(또는 초록들 또는 요약들), 평론들(또는 초록들 또는 요약들), 등등일 수 있다. The "other content" may be the suggested questions (eg, "___ Try searching"), news articles (or abstracts or summaries s), review of (or abstracts or summaries s), and so on. "다른 콘텐트"는 다양한 방식들 또는 형태들로 제공될 수 있다. "Other content" can be provided in various ways or forms. 예를 들어, 제안된 질문으로서, "연관 정보" 등등이 제공될 수 있다. For example, a proposed question, may be provided with a "related information" and so on. "다른 콘텐트"는 비록 필수적이지 않지만, 광고들로서 동일한 포맷 및/또는 지문을 가질 수 있다. "Other content", but not essential, though, may have the same format and / or fingerprints as advertising. 따라서, 예를 들어, 만약 광고들이 텍스트 기반 광고들이면, "다른 콘텐트"는 텍스트 기반일 수 있다. Thus, for example, if the ads are text-based ads deulyimyeon, "other content" can be text-based. 본 발명에 일관된 적어도 하나의 실시예에서, 텍스트 기반 "다른 콘텐트"는 제목의 4개의 라인들 중 하나(예를 들어, 굵고 및/또는 밑줄된), 텍스트의 3개의 라인들, 및 URL 라인(다른 문서에 대한 링크를 포함할 수 있음)을 포함할 수 있다. In consistent at least one embodiment of the present invention, a text-based "other content" is one of four lines of title (e. G., Coarse and / or underline a), three lines of the text field and a URL line ( It may include may include a link to another article). 다른 콘텐트 연관 정보가 렌더링되는 다양한 조건들 또는 환경들이 있을 수 있다. Which render other content related information may be various conditions or environment. 예를 들어, 본 발명에 일관된 적어도 몇몇 실시예들에서, "다른 콘텐트"는 콘텐트 연관 광고들을 렌더링하는 것과 무관하게 렌더링될 수 있다. For example, in at least some embodiments consistent with the present invention, the "other content" may be rendered, regardless as to render content-relevant ads. 상기 실시예들에서, 예를 들어 "다른 콘텐트"는 (a) 이용가능할 때, 또는 (b) 몇몇 임계치를 초과하는 스코어를 가지면(예를 들어, 하나 이상의 연관성, 이전 이용자 관심, 소스 신뢰도, 예상된 이용자 관심, 등등을 이용하여 결정됨) 렌더링될 수 있다. In the above embodiments, for example, the "other content" is (a), when available, or (b) Having a score that exceeds some threshold (e.g., one or more relevant, prior to user interest, source reliability, expected the user interest, as determined using the so on) can be rendered. 본 발명에 일관된 적어도 몇몇의 다른 실시예들에서, "다른 콘텐트"의 렌더링은 광고들의 렌더링에 다를 수 있다. In the present invention, consistent at least some other embodiments of the render of the "other content" may be different from the rendering of the ads. 상기 다른 실시예들에서, 예를 들어 "다른 콘텐트"는 (a) 만약 이용되지 않은 이용 가능한 광고 장소들이 있다면, (b) 만약 "다른 콘텐트가"가 광고들에 보다 연관되면(예를 들어, 미리 결정된 마진에 의해), (c) 만약 이용 가능한 장소들이 있고 "다른 콘텐트가"가 임계치를 초과하는 스코어를 가지며, 기타 등등이면 렌더링될 수 있다. When in the above other embodiment, for example, "other content" is (a) if not using available ad place are, (b) if the "other content is" is more related to the ad (e. G. by a predetermined margin), (c) if available, and to place the "other content is" a has a score exceeding the threshold, if so may be rendered. 도 5는 정보가 본 발명의 예시적인 실시예에서 다양한 예시적인 동작들 사이에서 교환되거나 통신될 수 있는 방법을 도시하는 메시징 도이다. Figure 5 is a messaging diagram illustrating the way in which information can be exchanged or communicated between the various exemplary operations in an exemplary embodiment of the invention. 클라이언트 장치 브라우저(150')는 웹 기반 이메일 서버(140')에 이메일 페이징에 대한 요구(510)를 통신한다. The client device browser (150 ') is a web-based e-mail server (140' communicates a request 510 to the e-mail paging). 그 다음 웹 기반 이메일 서버(140')는 요구된 이메일 페이지 및 요구 지문을 포함할 수 있는 응답(520)을 클라이언트 브라우저 장치(150')로 다시 전송한다. Then a web-based e-mail server (140 ') is a response (520), which may include the requested e-mail client, browser, pages and require fingerprint device (150' sends back). 웹 기반 이메일 서버(140')가 요구(510)를 수신한 후 몇몇 시간에서, 콘텐트 정보 및 요구 지문을 포함할 수 있는 광고들에 대한 요구(530)를 콘텐트-연관 광고 서버(110')에 제출한다. On - (a web-based e-mail server (140) associated with the ad server 110) is required at some time after receiving (510), content information and content requirements (530) for ads that may include a request fingerprint ' Submit. 콘텐트-연관 광고 서버(110')는 하나 이상의 광고들 및 요구 지문을 포함할 수 있는 응답(540)을 웹 기반 이메일 서버(140')에 다시 통신한다. Content-relevant ad server 110 'a response (540), which can include one or more ads and a web-based e-mail server requires a fingerprint (140' again communication). 클라이언트 장치 브라우저(150')가 응답(520)을 수신할 때, 요구된 웹 페이지를 렌더링하고 하나 이상의 광고들에 대한, 요구 지문을 포함할 수 있는 요구(550a)를 웹 기반 광고 서버(140')에 다시 통신할 수 있다. "When a response is received 520, the request (550a) that can render the requested Web page includes, request fingerprint for one or more ads for Web-based ad server (140 Client device browser 150 ' ) it may be further in communication. 이런 방식으로, 웹 페이지는 하나 이상의 광고들을 기다리지 않고 렌더링될 수 있다. In this way, the web page may be rendered without waiting for one or more ads. 웹 기반 이메일 서버는 이전에 저장된 광고(들)을 찾기 위하여 요구 지문을 이용할 수 있다. Web-based e-mail server can be used to require fingerprints to find the old ad (s) saved. 만약 광고(들)을 가지면, 광고들은 통신(560)에 의해 표시된 바와 같이 요구한 클라이언트 장치 브라우저(150')에 리턴될 수 있다. If has the ad (s), the ad can be returned to the communication 560, by the client device browser 150 'as indicated by the request. (a) 웹 기반 이메일 서버(140')가 통신(550a)에 표시된 바와 같이 광고(들)을 수신한 후, (b) 웹 기반 이메일 서버가 통신(550b)에 의해 표시된 바와 같이 광고(들)을 수신하기 전, 웹 기반 이메일 서버(140')가 콘텐트-연관 광고 서버(110')로부터 광고(들)을 요구한 후, 또는 (c) 웹 기반 이메일 서버(140')가 통신(550c)에 의해 표시된 바와 같이 콘텐트-연관 광고 서버(110')로부터 광고(들)을 요구하기 전에, 클라이언트 장치 브라우저(150')로부터의 광고 요구(550)가 웹 기반 이메일 서버(140')에서 수신된다는 것이 주의된다. (A) after receiving the advertisement (s), such as a Web-based e-mail server 140 'as indicated in the communication (550a), (b) ads, as indicated, a Web-based e-mail server by a communication (550b) (s) All web-based e-mail server (140 '), the content-relevant ad server (110' to receive a request for the ad (s) from), then or (c) is a web-based e-mail server (140 ') communication (550c) content, as indicated by the - "before requesting the ad (s) from the client device browser (150 relevant ad server 110 'ad requests (550) from a) are being received from a Web-based e-mail server 140' it is noticed. 다른 실시예에서, 브라우저(150')는 콘텐트-연관 광고 서버(110')로부터 직접 광고를 요구할 수 있다. In another embodiment, the browser 150 'is content-relevant ad server (110' may request directly from the ad). 그러나, 상기 다른 실시예는 광고 서버(110')가 많은 클라언트들(150')과 보자 직접적으로 통신하기 때문에 부가적인 보안 관심들을 상승시킬 수 있고, 상기 많은 클라이언트들의 몇몇은 호의적이지 않을 수 있다. However, this alternative embodiment may raise additional security concerns since the let the ad server 110 'has a number of client function 150' communicate directly, and some of the large number of clients can not be favorably . 따라서, 적어도 보안 관점에서, 광고 서버(110')가 이메일 서버(140')에 이용 가능하지만, 클라이언트들(150')에 이용 가능하지 않은 것이 바람직할 수 있다. Thus, in at least a security point of view, it is available to the ad server 110 'email server 140', but is not available to the client 150 'may be preferred. 도 6은 이메일 콘텐트(610) 및 텍스트 기반 콘텐트 연관 광고들(620)을 포함하는 예시적인 브라우저 윈도우(600)를 도시한다. Figure 6 illustrates an exemplary browser window 600 including e-mail content of the (610) and text-based content-relevant ads (620). 상기에 의해 인식된 바와 같이, 본 발명에 일관된 실시예들은, 연관이 없고 소용없는 광고들이 이용자들을 성가시게 하거나 혼란스럽게 하지 않고 또한 이메일을 렌더링할 때의 지연들을 가지지 않으면서 웹 기반 이메일의 이용자들에게 효과적으로 광고를 전달하기 위하여 이용될 수 있다. As recognized by the above, consistent with an embodiment of the present invention, there is no associated avail ads are not carefully annoy or confuse the user does not also users of standing web based email if you have a delay in rendering your email effectively it can be used to deliver your ads to. 예를 들어, 본 발명에 일관된 실시예들은 렌더링되는 이메일의 콘텐트와 연관하여 광고들을 서빙하기 용이하게 한다. For example, embodiments consistent with the present invention makes it easy to serve ads in association with the content of the e-mail being rendered. 게다가, 본 발명의 실시예들은 이메일 이용자 및 이메일 콘텐트의 렌더링에 덜 훼방적인 방식으로 광고들을 서빙하기 용이하게 한다. In addition, embodiments of the present invention makes it easy to serve ads in a less intrude manner to render the e-mail user and the e-mail content. 일반적으로는 이메일 콘텐트는 사적인 것이다. Typically, e-mail content will be private. 이용자가 공적으로 이용가능한 웹 콘텐트를 간단히 브라우징하는 때에는, 인터럽트 없이 이메일을 보다 빠르게 읽고 싶어한다. When a user is simply browsing the Web content available to the public, and I want to read faster than e-mail without interruption. 본 발명에 일관된 몇몇 실시예들에서는, 광고들의 이용 가능성은 이메일 콘텐트의 렌더링에 영향을 미치지 않는다. In some embodiments consistent with the present invention, availability of advertising does not affect the rendering of e-mail content. 그렇지 않은 경우라면, 만약 웹 기반 이메일 서버의 광고 구성요소가 일시적으로 이용될 수 없거나 오버로드되는 경우, 이메일 렌더링이 지연되거나(delayed) 숨겨질(hidden) 수 있다. If that is not the case, if the advertising component of a Web-based e-mail server can be used, or if a temporary overload, the email rendering is delayed (delayed) to be hidden (hidden). 본 발명에 일관된 실시예들은 이용자의 이메일이 즉각적으로 렌더링되게 하고, 그 다음 이용 가능하게 될 때 적당한 광고들이 업데이트되는 비동기적이고 기회주의적으로 이용 가능한 해결책을 제공한다. Consistent with the present invention are carried out and the user's email will be immediately rendered in, and then provides asynchronous and opportunistically available solution that can be proper when it comes to advertising their updates available. 게다가, 광고 서빙은 수신부의 단부에서 발생하기 때문에(즉, 이메일 메시지들은 특정 이용자에 의해 읽히거나 렌더링됨), 이메일의 전송자가 이메일과 연관하여 광고들을 서빙하는 것을 지원하는 시스템을 가질 필요가 없다. In addition, because it occurs at the ad serving the ends of the receiver does not need to have a system that supports (i. E., E-mail messages are being by a particular user read or rendered), the transmission of e-mail self-serve ads in association with e-mail. h) 이메일 콘텐트를 포함하는 상기 수용된 문서와 연관하여 상기 판독된 적어도 하나의 광고를 서빙하는 단계를 포함하는, 광고들을 서빙하는 방법. h) To in association with the received document including e-mail content, serve ads comprising serving at least one advertisement of the read. 상기 광고 요구는 상기 요구된 문서가 렌더링될 때, 또는 렌더링된 후, 브라우저에 의해 소싱(sourcing)되는, 광고들을 서빙하는 방법. The ad request is how to serve them when the requested documents to be rendered, or rendered later, that sourcing (sourcing) by the browser, and advertising. 상기 얻어진 적어도 하나의 광고를 저장하는 단계는 상기 적어도 하나의 광고와 연관하여 상기 요구 식별자를 저장하는 단계를 포함하는, 광고들을 서빙하는 방법. Storing the obtained at least one ad is a method that serves the, ad storing the request identifier in association with the at least one advertisement. 상기 요구 식별자는 상기 연관된 적어도 하나의 광고를 찾기 위한 일차 키로서 이용될 수 있는, 광고들을 서빙하는 방법. The request identifier is to serve ads that may be used as a primary key to look for at least one advertisement associated with the,. 상기 광고 요구는 상기 요구 식별자를 포함하고, 상기 광고 요구로부터의 정보를 이용하여 상기 저장된 적어도 하나의 광고를 판독하는 단계는 상기 연관된 적어도 하나의 광고를 찾기 위하여 상기 요구 식별자를 이용하는, 광고들을 서빙하는 방법. Wherein the ad request includes the request identifier, using information from the ad request includes reading at least one advertisement of the stored is to serve ads using the request identifier, and to look for at least one ad the associated Way. 상기 요구 식별자와 연관하여 상기 요구된 문서를 서빙하는 단계는 제 1 스레드에 의해 수행되고, 상기 이메일의 콘텐트와 연관된 적어도 하나의 광고를 얻는 단계는 제 2 스레드에 의해 수행되고, 상기 제 1 스레드의 실행은 제 2 스레드의 실행과 독립적인, 광고들을 서빙하는 방법. The step of serving a document with the request in association with the request identifier is performed by the first thread, to obtain at least one advertisement associated with the content of the e-mail is performed by a second thread, the first thread execution method for executing the serving and independent of advertising of the second thread. 상기 이메일의 콘텐트와 연관된 적어도 하나의 광고를 얻는 단계는 콘텐트-연관 광고 서버에 광고 요구를 제출하는 단계를 포함하고, 상기 광고 요구는 상기 요구 식별자를 포함하는, 광고들을 서빙하는 방법. Obtaining at least one ad associated with the content of the email content - the ad request comprises submitting a request to the ad server ad associate, it is how to serve ads, including the request identifier. 이메일 콘텐트를 포함하는 상기 문서는 (A) 이메일 메시지들의 그룹, (B) 대화로서 이메일 스레드 출력, 또는 (C) 이메일들의 그룹을 포함하는 대화 뷰(view)를 나타내는, 광고들을 서빙하는 방법. Wherein the document including e-mail content is how to serve ads (A) representing the conversation view (view) including a group of e-mail thread output, or (C) a group of e-mail, (B) conversation of email messages. f) 상기 렌더링된 문서와 연관하여 상기 적어도 하나의 광고를 렌더링하는 단계를 포함하고, 상기 적어도 하나의 광고는 상기 문서의 상기 이메일 콘텐트가 이미 렌더링된 후 렌더링되는, 광고 렌더링 방법. f), how to render the ad are rendered after the comprising in association with the rendered document, rendering the at least one advertisement and the at least one advertisement that is the e-mail content of the document already been rendered. 상기 수용된 문서는 요구 식별자를 포함하고, 상기 문서의 이메일 콘텐트와 연관된 적어도 하나의 광고를 요구하는 단계는 상기 요구 식별자를 포함하는 요구를 생성하는 단계를 포함하는, 광고 렌더링 방법. The method comprising the accepted document includes a request identifier, and the request at least one advertisement associated with the e-mail content of the document, the method for rendering ads generating a request including the request identifier. 상기 문서의 상기 이메일 콘텐트와 연관하여 적어도 하나의 광고를 요구하는 단계는 적어도 하나의 광고에 대한 요구를 나타내는 URL을 구성하는 단계를 포함하고, 상기 문서의 상기 이메일 콘텐트와 연관하여 적어도 하나의 광고를 요구하는 단계는 상기 URL을 취하고 상기 문서를 소싱한 웹 기반 이메일 서버로부터 상기 적어도 하나의 광고를 요구하는 액티브엑스 오브젝트(ActiveX object)를 인스턴시에이팅(instantiating)하는 단계를 더 포함하는, 광고 렌더링 방법. Comprising: in association with the e-mail content of the document requesting at least one ad, including the steps to configure a URL indicating the need for at least one ad, and associated with the e-mail content of the document, at least one advertisement steps required, the ad rendering that takes the URL further comprises at least one of the ActiveX object (ActiveX object) for instance Associates marketing (instantiating) requesting an ad from a web-based e-mail server, source the document Way. 상기 문서는 웹 페이지이고, 상기 문서의 상기 렌더링된 이메일 콘텐트와 연관하여 상기 적어도 하나의 광고를 렌더링하는 단계는 상기 광고들을 렌더링하기 위하여 상기 웹 페이지의 문서 오브젝트 모델을 조작하는 단계를 포함하는, 광고 렌더링 방법. The document is a web page, comprising: in association with the rendered email content of the document rendering the at least one advertisement, advertising, comprising the step of manipulating the Document Object Model of the web page in order to render the advertisement how to render. 상기 렌더링된 문서와 연관하여 상기 적어도 하나의 광고를 렌더링하는 단계는 상기 문서가 변경되지 않도록 행해지는, 광고 렌더링 방법. Further comprising: in association with the rendered document, rendering the at least one advertising method is performed, the ad so as not to render the document changes. 상기 렌더링된 문서와 연관하여 상기 적어도 하나의 광고를 렌더링하는 단계는 상기 적어도 하나의 광고가 상기 문서의 일부가 되지 않도록 수행되는, 광고 렌더링 방법. Wherein, in association with the rendered document, the method comprising rendering the at least one advertising method, line rendering is performed so that the at least one ad does not become part of the document. 이메일 콘텐트를 포함하는 상기 문서는 (A) 이메일들의 그룹, (B) 이메일 스레드, 및 (C) 이메일들의 그룹을 포함하는 대화 뷰인, 광고 렌더링 방법. Wherein the document including e-mail content is (A) a group of e-mail, (B) an email thread, and (C) a view, conversation, rendered advertising method including a group of e-mail. h) 이메일 콘텐트를 포함하는 상기 수용된 문서와 연관하여 상기 판독된 적어도 하나의 광고를 서빙하는 수단을 포함하는, 광고들을 서빙하는 장치. h), apparatus for serving ads, including in association with the received document including e-mail content and means for serving at least one advertisement of the read. 상기 광고 요구는 상기 요구된 문서가 렌더링될 때, 또는 렌더링된 후 브라우저에 의해 소싱되는, 광고들을 서빙하는 장치. The ad unit is required to serve ads, which is sourced by the time that the requested documents to be rendered, or rendered after browser. 상기 저장된 적어도 하나의 광고는 상기 적어도 하나의 광고와 연관하여 저장된 상기 요구 식별자를 포함하는, 광고들을 서빙하는 장치. It said stored at least one ad is a device that serves, ad that includes the request identifier stored in association with the at least one ad. 상기 요구 식별자는 상기 연관된 적어도 하나의 광고를 찾기 위한 일차 키(primary key)로서 이용될 수 있는, 광고들을 서빙하는 장치. The request identifier is a device to serve ads that may be used as a primary key (primary key) for finding at least one advertisement associated with the,. 상기 광고 요구는 상기 요구 식별자를 포함하고, 상기 광고 요구로부터의 정보를 이용하여 상기 저장된 적어도 하나의 광고를 판독하는 수단은 상기 연관된 적어도 하나의 광고를 찾기 위하여 상기 요구 식별자를 이용하는, 광고들을 서빙하는 장치. Wherein the ad request includes the request identifier, using information from the ad request means that the stored reading at least one line is to serve ads using the request identifier, and to look for at least one ad the associated Device. 상기 요구 식별자와 연관하여 상기 요구된 문서를 서빙하는 수단은 제 1 스레드이고, 상기 이메일의 콘텐트와 연관하여 적어도 하나의 광고를 얻는 수단은 제 2 스레드이고, 상기 제 1 스레드의 실행은 제 2 스레드의 실행과 독립적인, 광고들을 서빙하는 장치. Means for serving a document with the request in association with the request identifier is a first thread, and means for obtaining at least one ad in association with the content of the e-mail is a second thread, the execution of the first thread to the second thread devices serving as an independent executable, advertising. 상기 이메일의 콘텐트와 연관하여 적어도 하나의 광고를 얻는 수단은 콘텐트-연관 광고 서버에 광고 요구를 제출하는 수단을 포함하고, 상기 광고 요구는 상기 요구 식별자를 포함하는, 광고들을 서빙하는 장치. Means for obtaining at least one ad associated with the content of the email content - the ad request includes means for submitting a request to the ad server ad associate, are devices that serve ads, including the request identifier. 이메일 콘텐트를 포함하는 상기 문서는 (A) 이메일 메시지들의 그룹, (B) 대화로서 이메일 스레드 출력, 또는 (C) 이메일들의 그룹을 포함하는 대화 뷰인, 광고들을 서빙하는 장치. The article (A) a group of e-mail messages, (B) e-mail thread output as a conversation, or (C) a view, conversation, an apparatus for serving ads including a group of e-mail including the e-mail content. f) 상기 렌더링된 문서에 연관하여 상기 적어도 하나의 광고를 렌더링하는 수단을 포함하고, 상기 적어도 하나의 광고는 상기 문서의 상기 이메일 콘텐트가 이미 렌더링된 후 렌더링되는, 광고 렌더링 장치. f) ad rendering device, is rendered after the means for association with the rendered document to render the at least one advertisement and the at least one advertisement that is the e-mail content of the document already been rendered. 상기 수용된 문서는 요구 식별자를 포함하고, 상기 문서의 상기 이메일 콘텐트와 연관하여 상기 적어도 하나의 광고를 요구하는 수단은 상기 요구 식별자를 포함하는 요구를 생성하는 수단을 포함하는, 광고 렌더링 장치. The received document that includes the request identifier, and the association with the e-mail content of the document, means for requesting the at least one advertisement comprises means for generating a request including the request identifier, ad rendering device. 상기 문서의 상기 이메일 콘텐트와 연관하여 적어도 하나의 광고를 요구하는 수단은 적어도 하나의 광고에 대한 요구를 나타내는 URL을 구성하는 수단을 포함하고, 상기 URL을 취하고 상기 문서를 소싱한 웹 기반 이메일 서버로부터 적어도 하나의 광고를 요구하는 액티브엑스 오브젝트를 인스턴시에이팅하는 수단을 더 포함하는, 광고 렌더링 장치. It means in association with the e-mail content of the document needs at least one ad from at least the means to construct a URL that indicates a request for an ad, take the URL sourcing the documents Web-based e-mail server , ad rendering device further includes at least one means for putting an instance Associates ActiveX object which requires the ad. 상기 문서는 웹 페이지이고, 상기 문서의 상기 렌더링된 이메일 콘텐트와 연관하여 상기 적어도 하나의 광고를 렌더링하는 수단은 상기 광고들을 렌더링하기 위하여 상기 웹 페이지의 문서 오브젝트 모델을 조작하는 수단을 포함하는, 광고 렌더링 장치. The document is a web page, and means in association with the rendered email content of the document rendering the at least one advertisement, the advertisement comprises means for manipulating the Document Object Model of the web page in order to render the advertisement rendering device. 상기 렌더링된 문서와 연관하여 상기 적어도 하나의 광고를 렌더링하는 수단은 상기 문서를 변경하지 않는, 광고 렌더링 장치. It means for, in association with the rendered document, rendering the at least one ad is not to change the document, line rendering device. 상기 렌더링된 문서와 연관하여 상기 적어도 하나의 광고를 렌더링하는 수단은 상기 적어도 하나의 광고가 상기 문서의 일부가 되지 않게 하는, 광고 렌더링 장치. Wherein, in association with the rendered document, means for rendering the at least one advertisement, the advertisement rendering device to the at least one ad does not become part of the document. 이메일 콘텐트를 포함하는 상기 문서는 (A) 이메일들의 그룹, (B) 이메일 스레드, 또는 (C) 이메일들의 그룹을 포함하는 대화 뷰인, 광고 렌더링 장치. Wherein the document including e-mail content is (A) a group of e-mail, (B) an email thread, or (C) a view, dialog, line rendering unit including a group of e-mail.